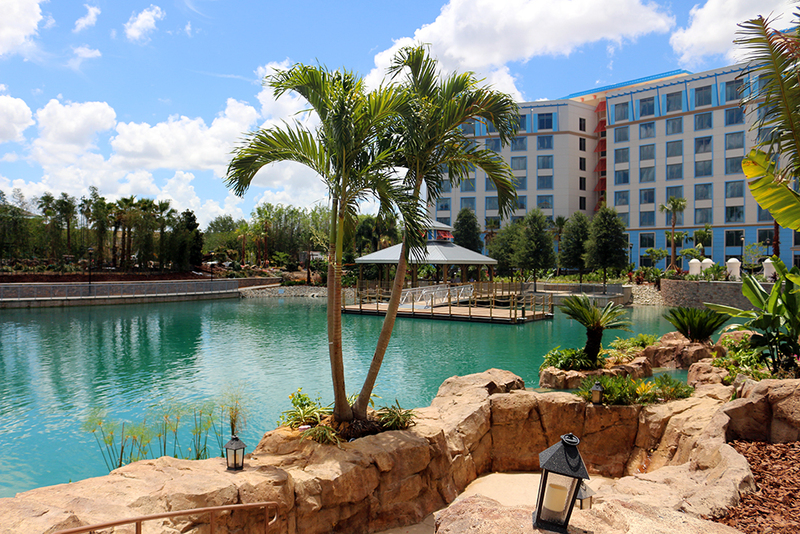 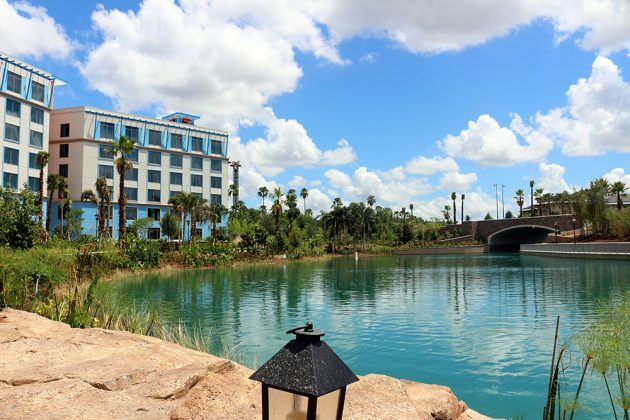 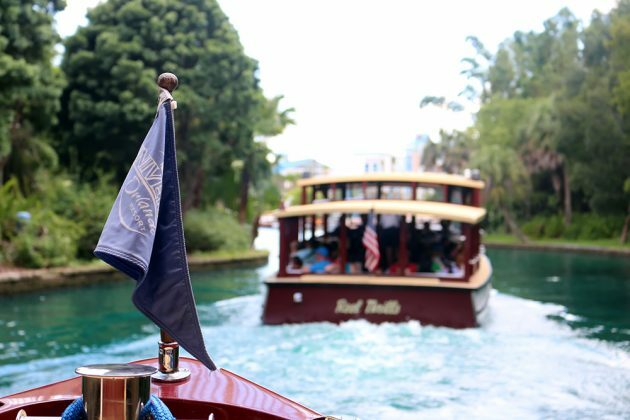 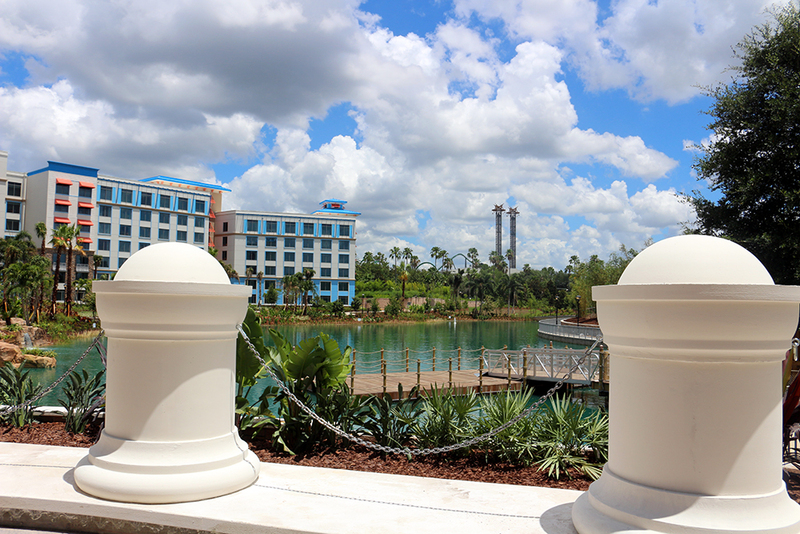 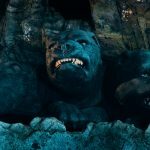 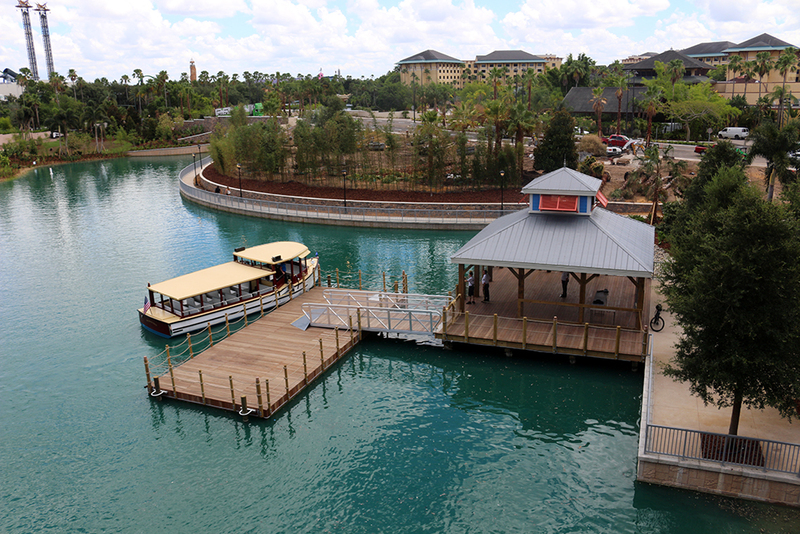 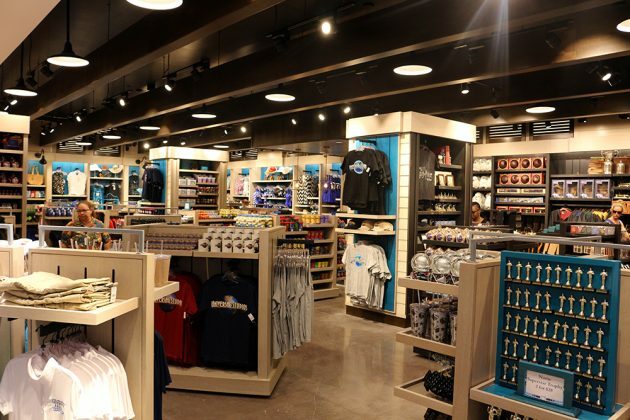 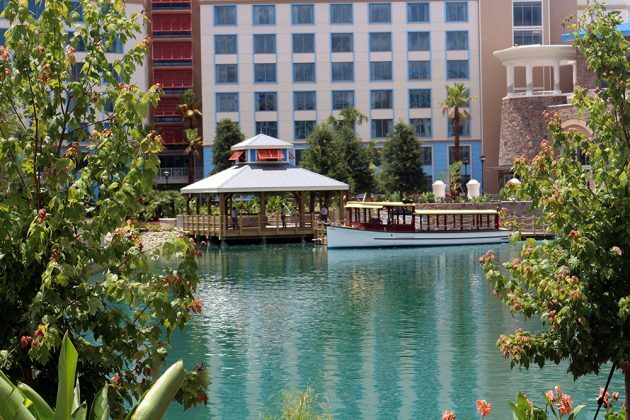 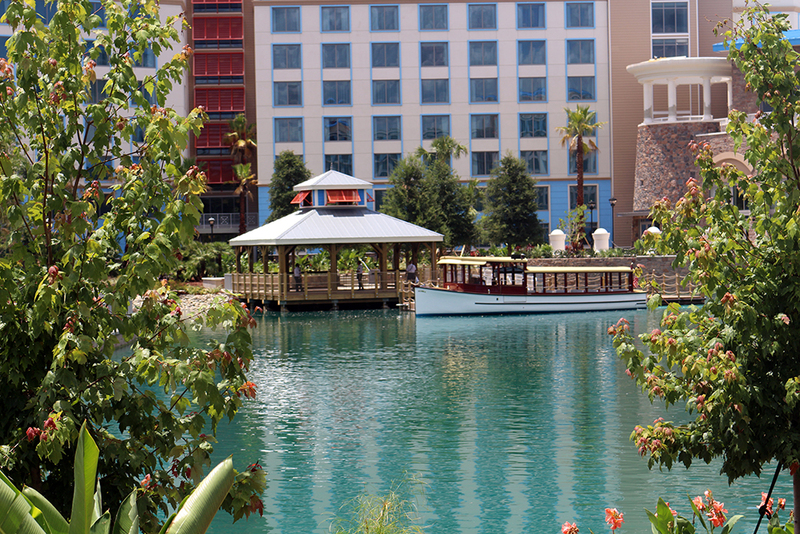 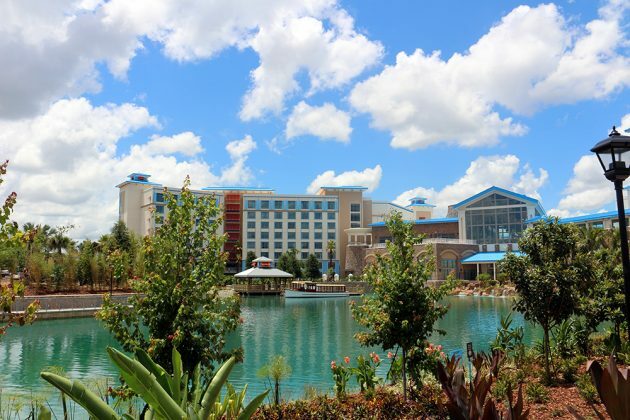 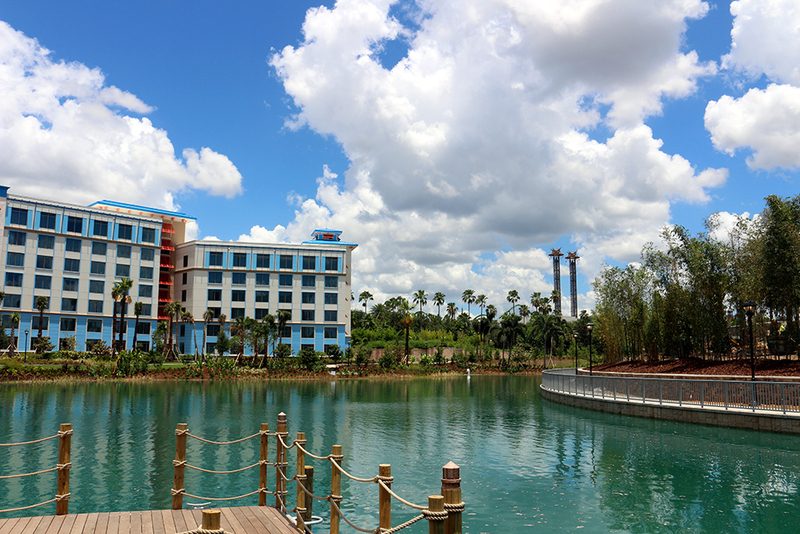 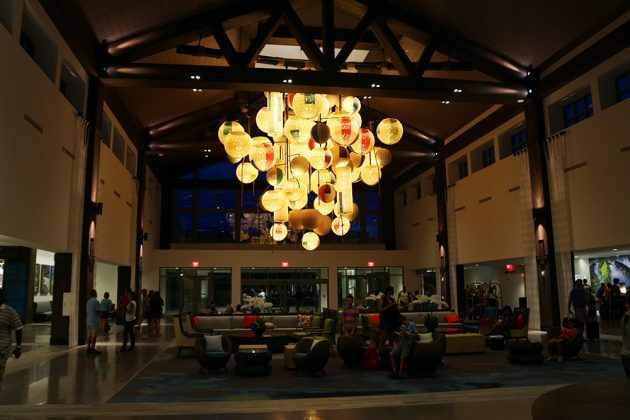 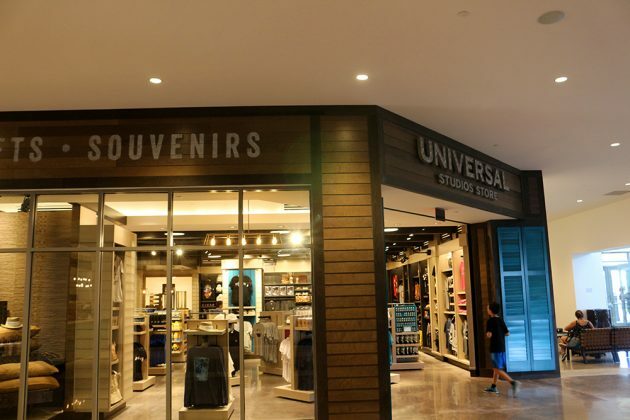 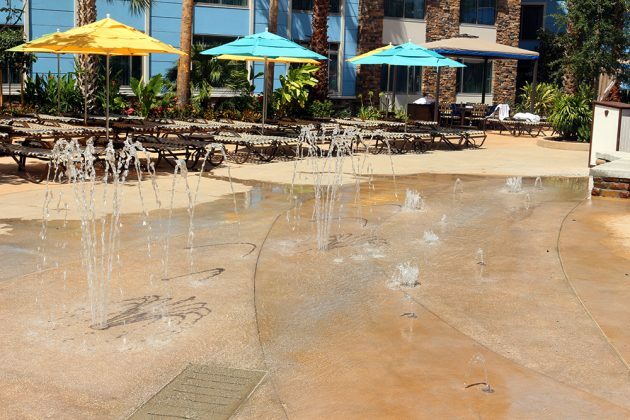 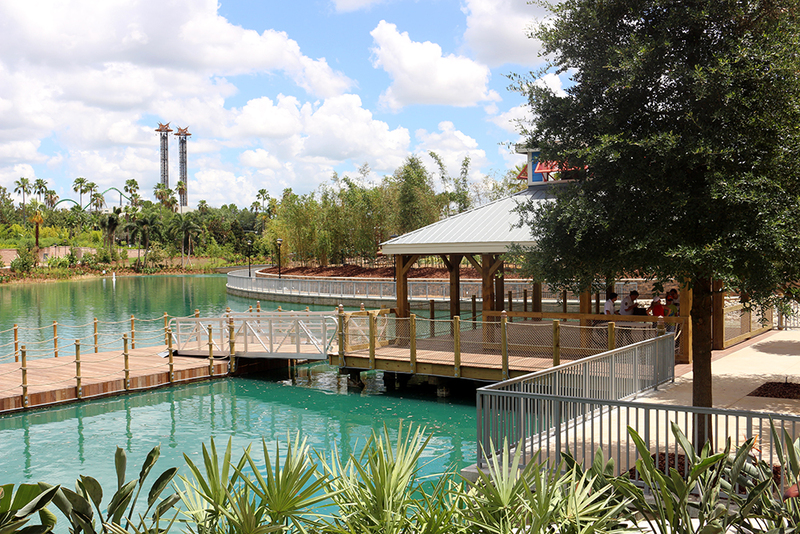 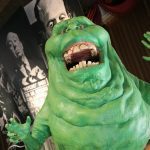 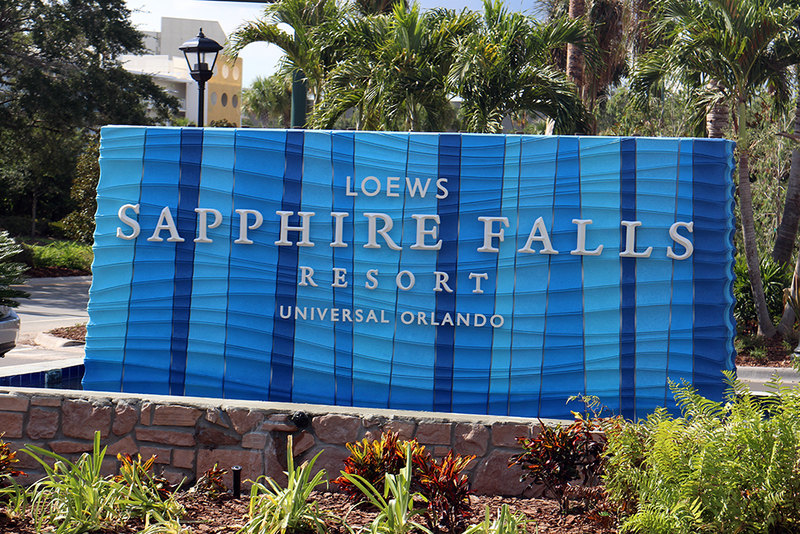 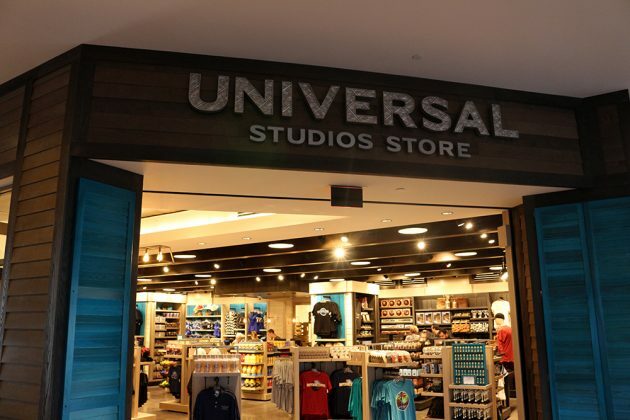 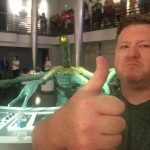 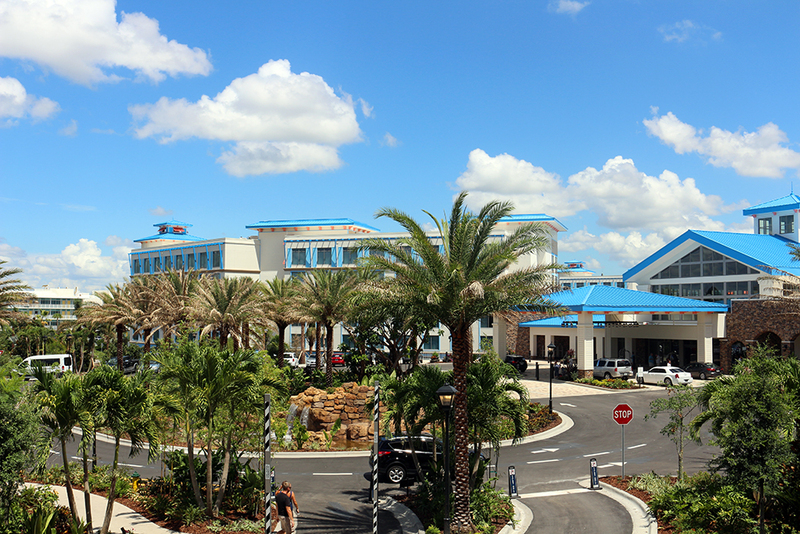 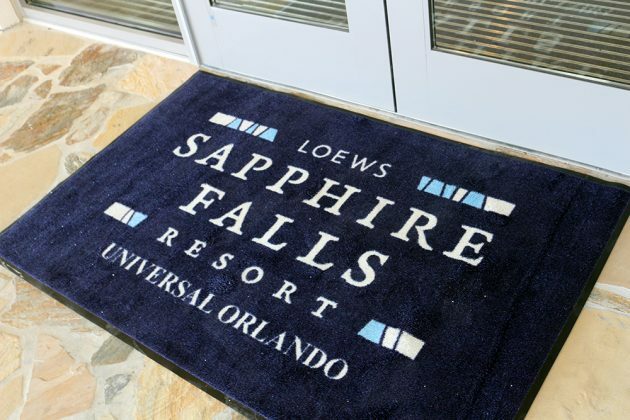 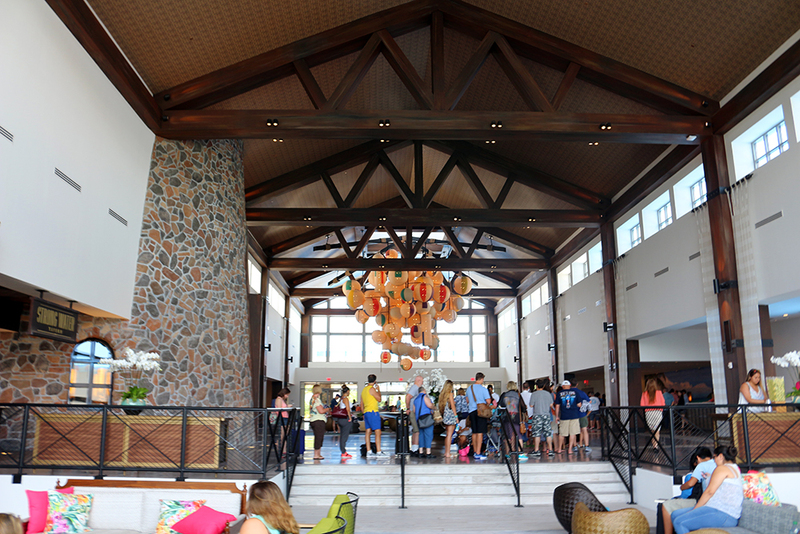 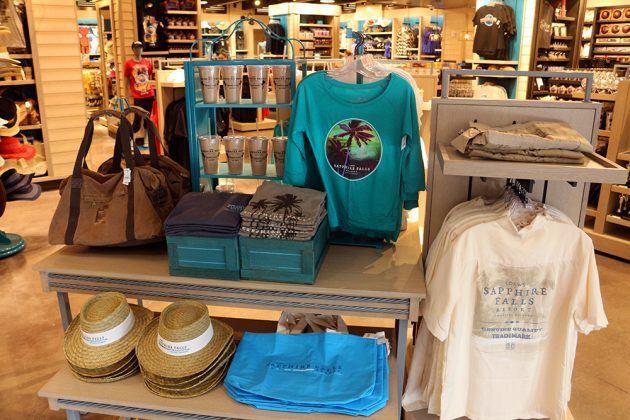 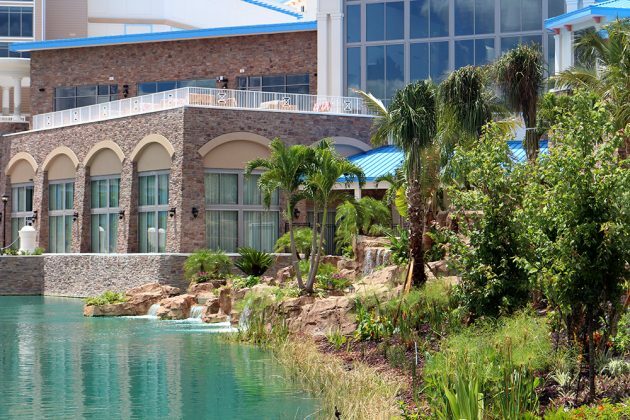 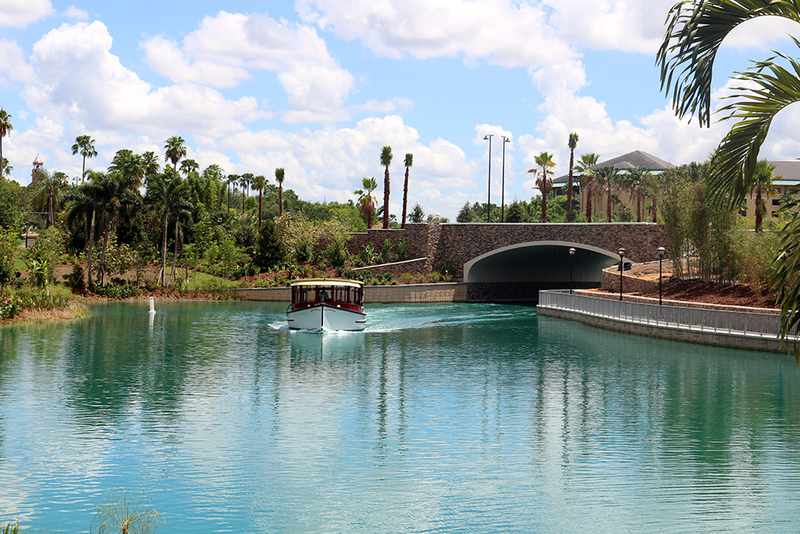 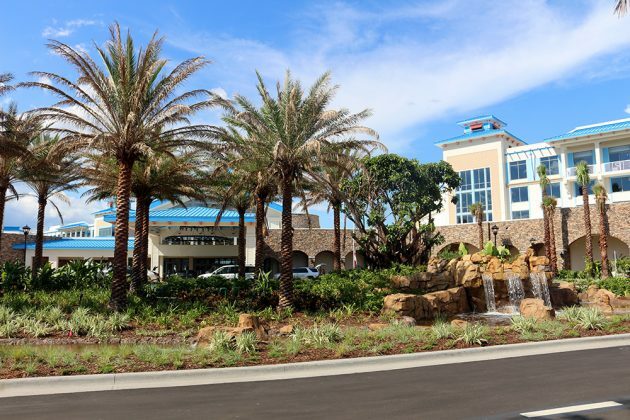 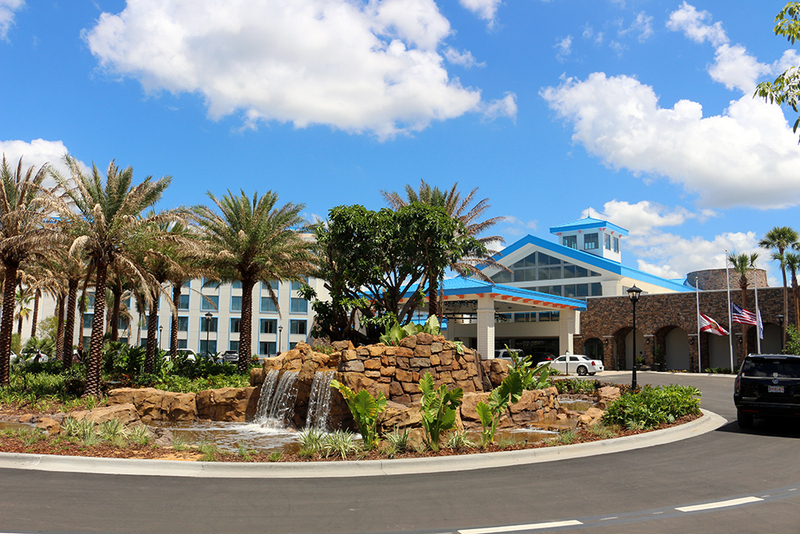 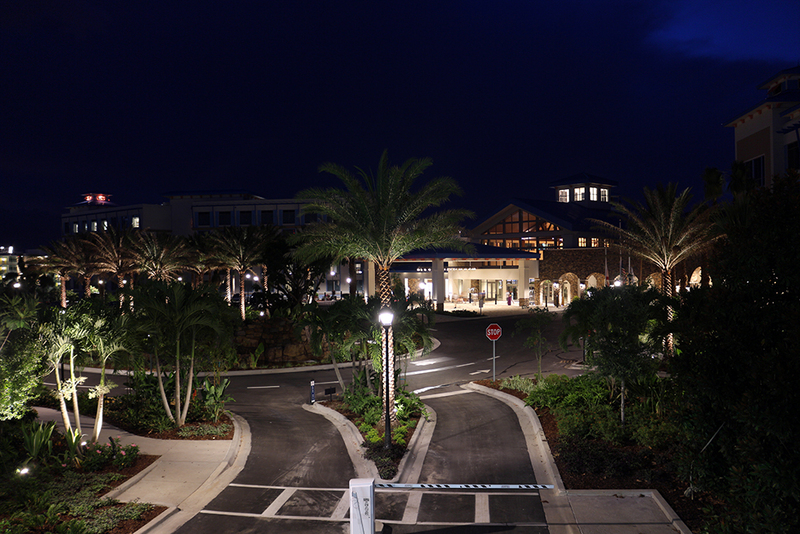 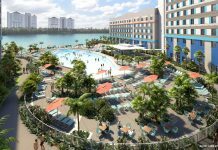 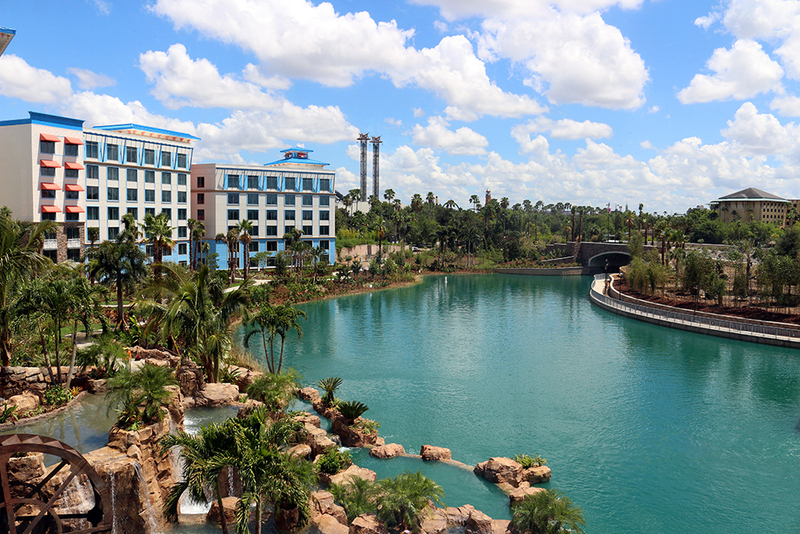 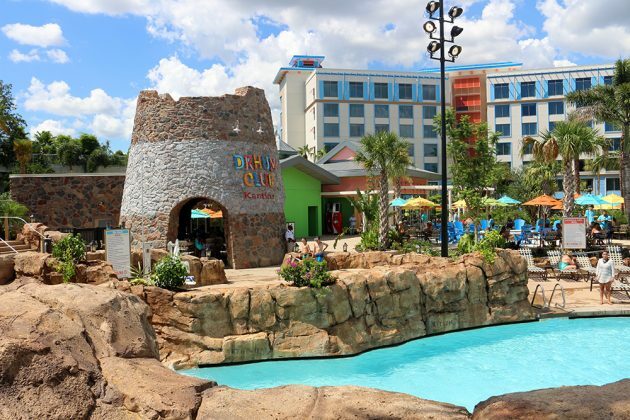 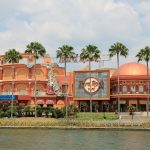 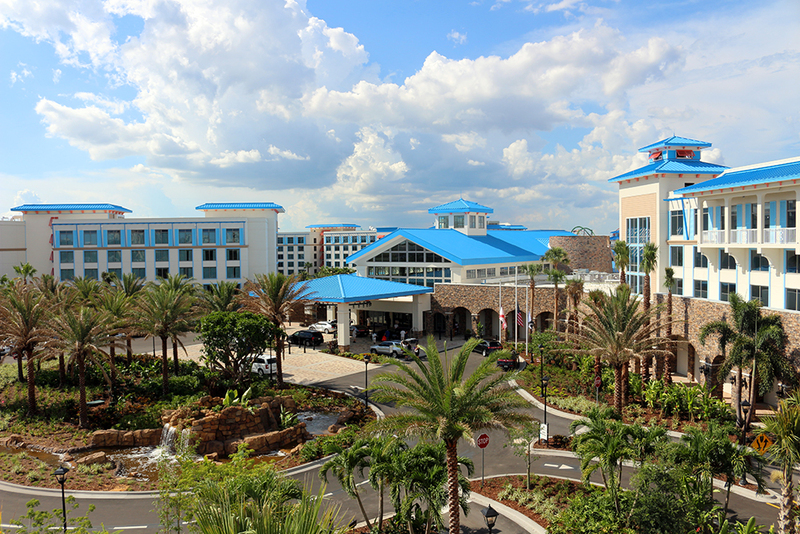 Universal Orlando officially opened up their 5th on-site hotel on Thursday – Loews Sapphire Falls Resort. 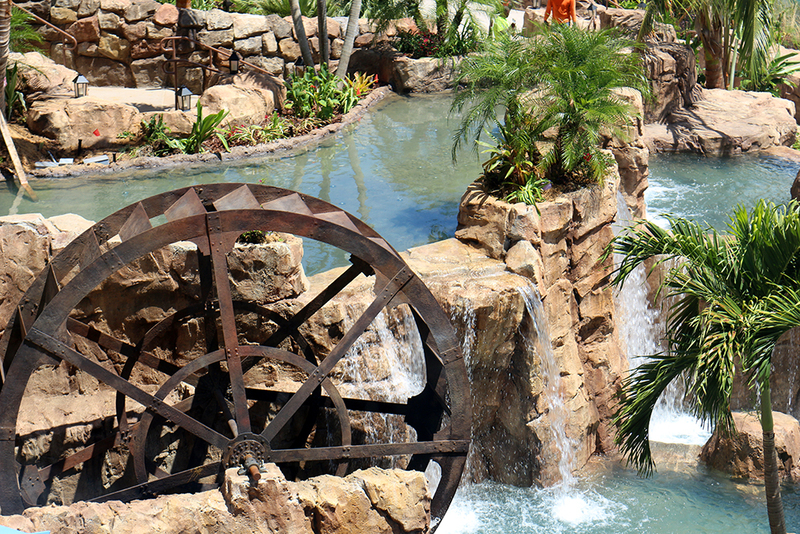 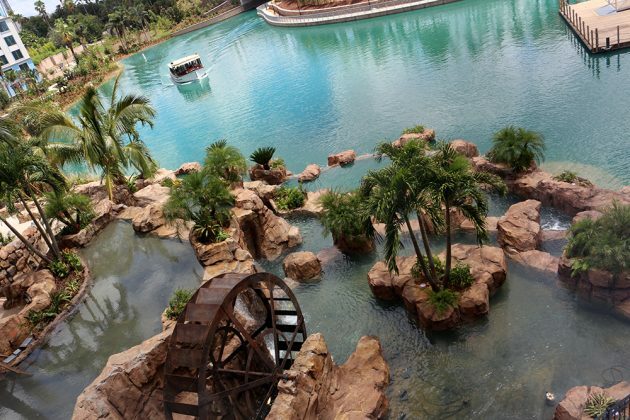 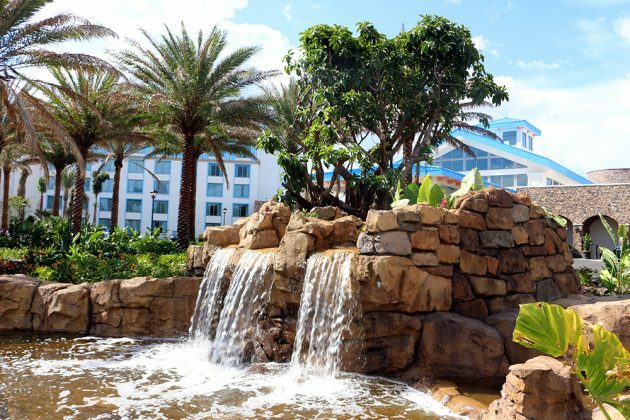 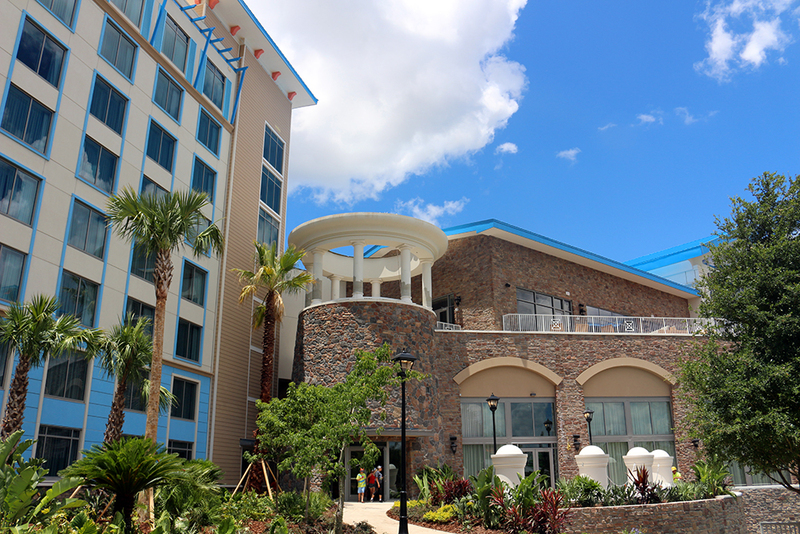 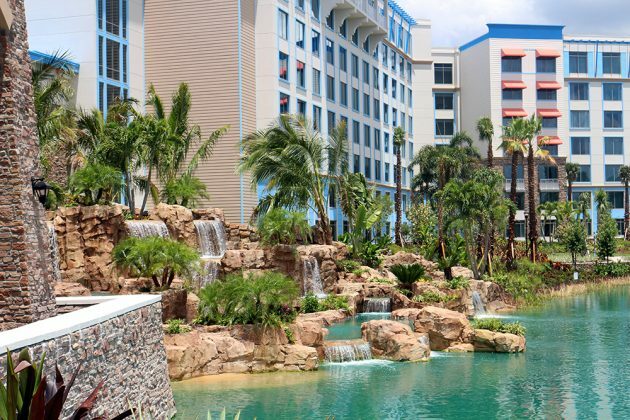 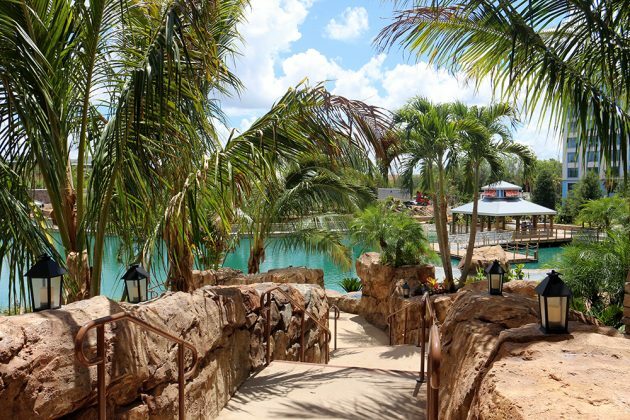 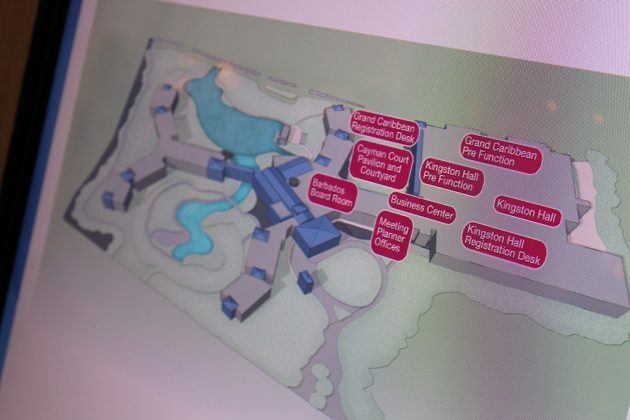 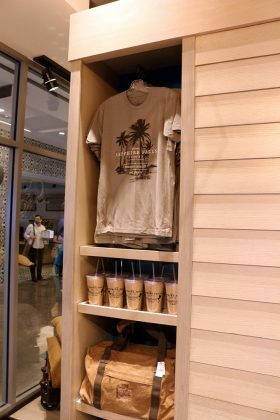 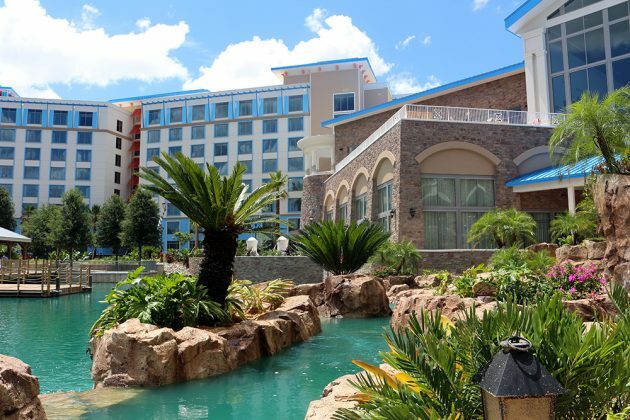 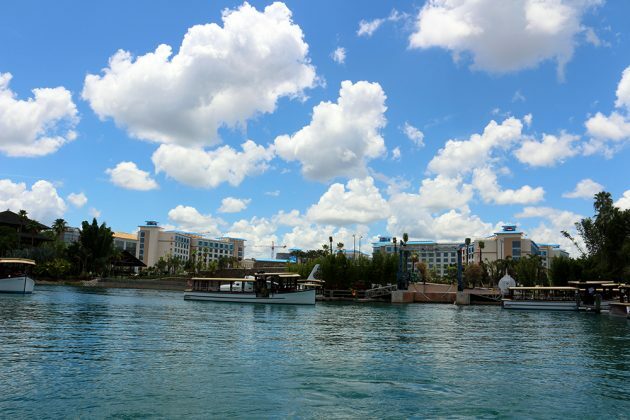 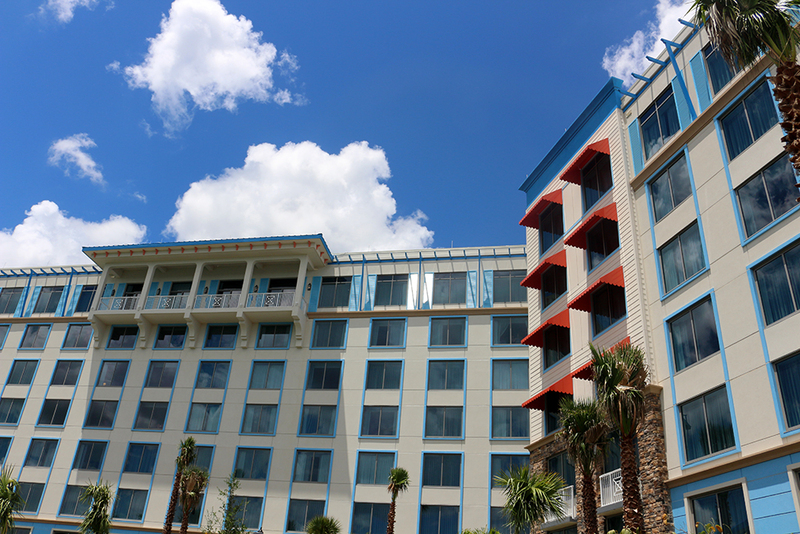 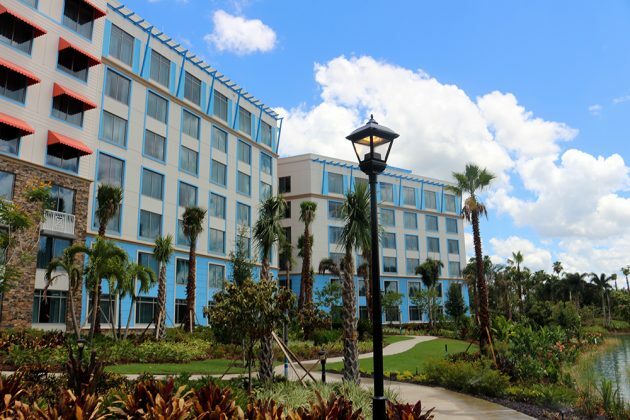 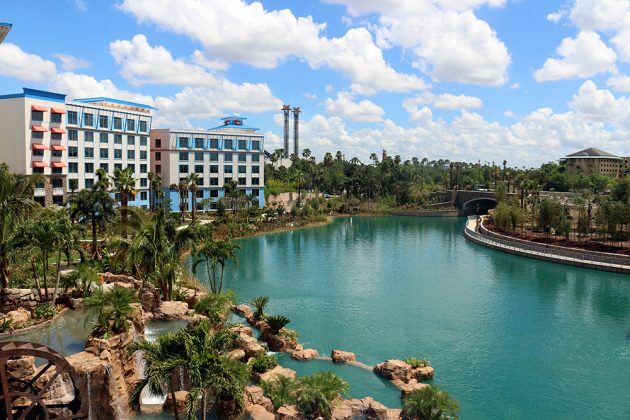 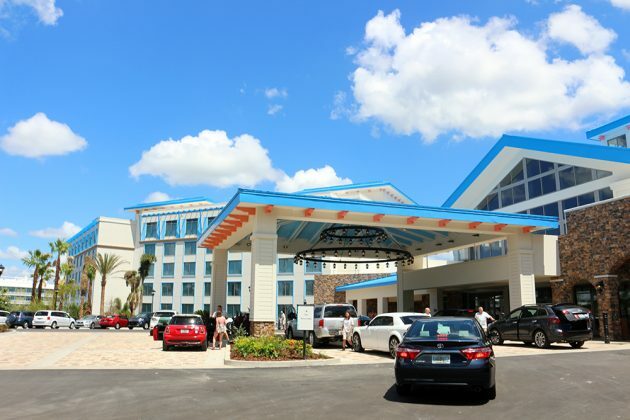 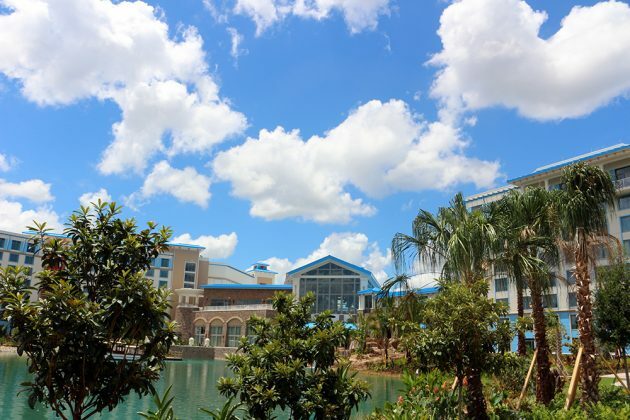 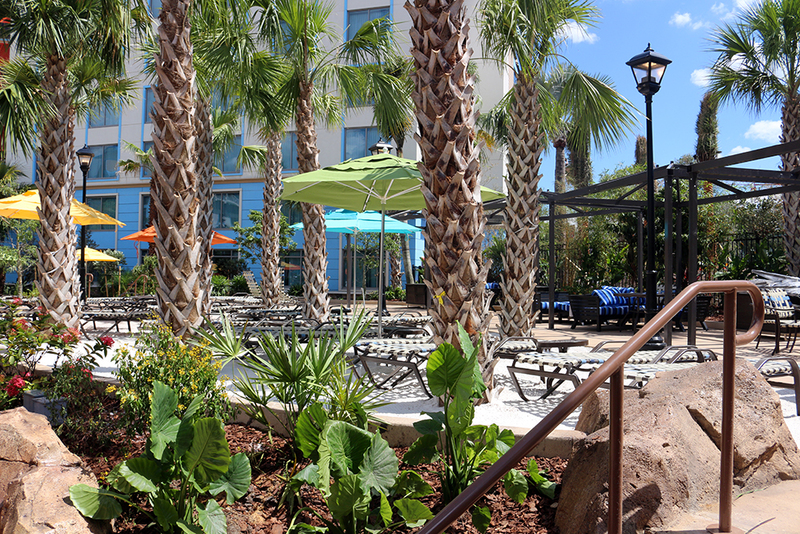 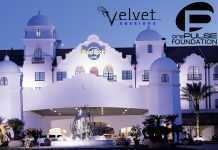 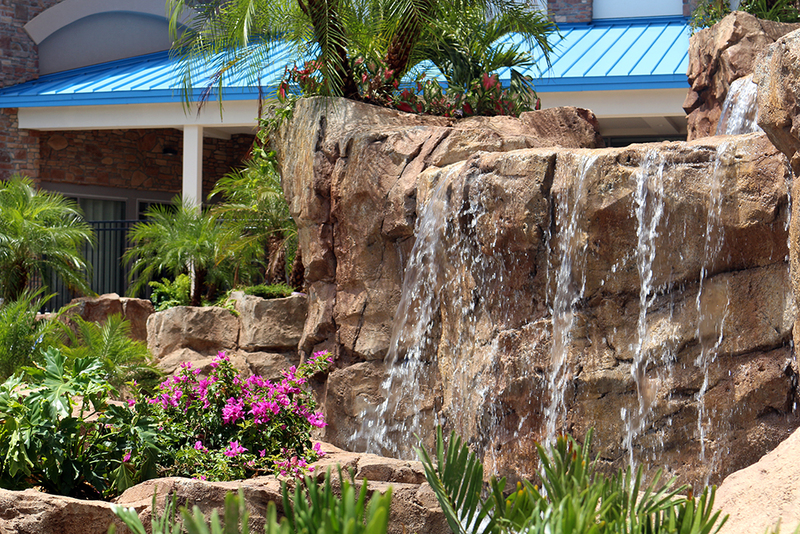 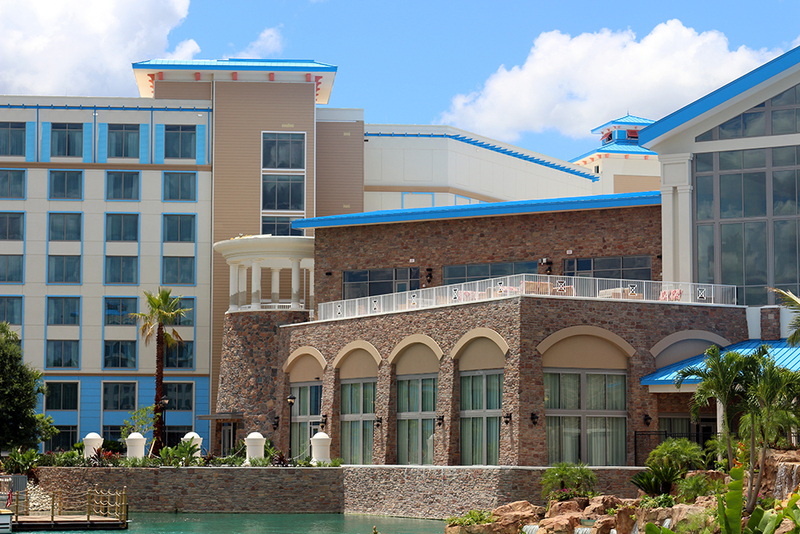 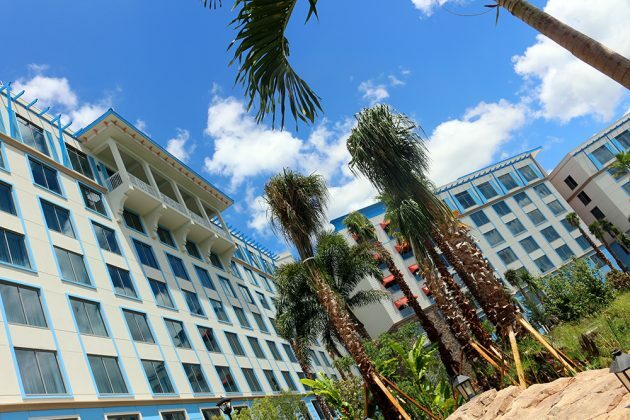 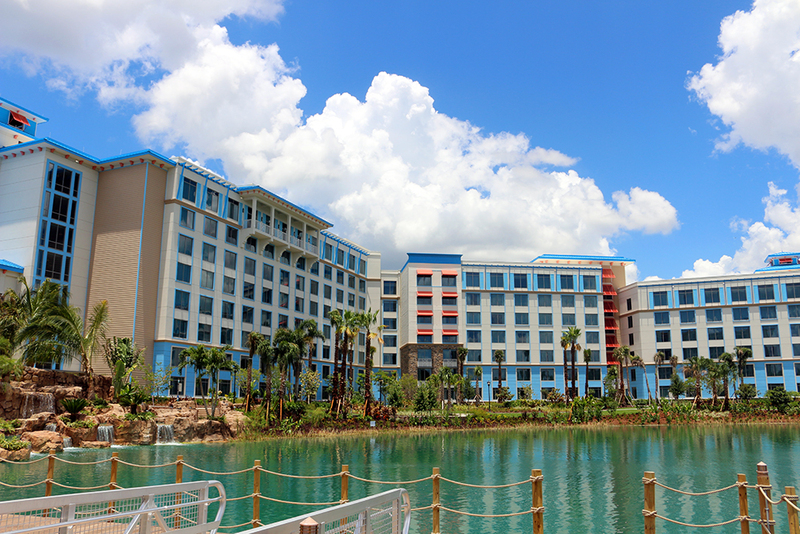 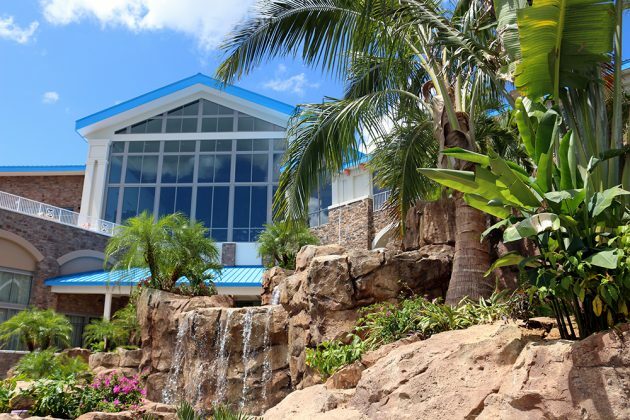 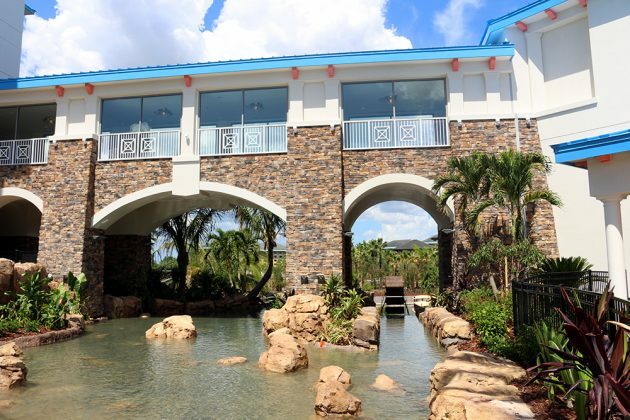 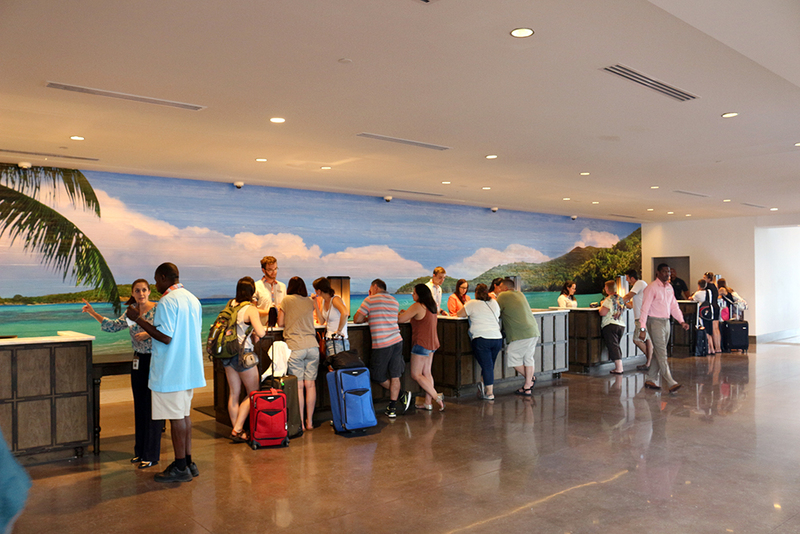 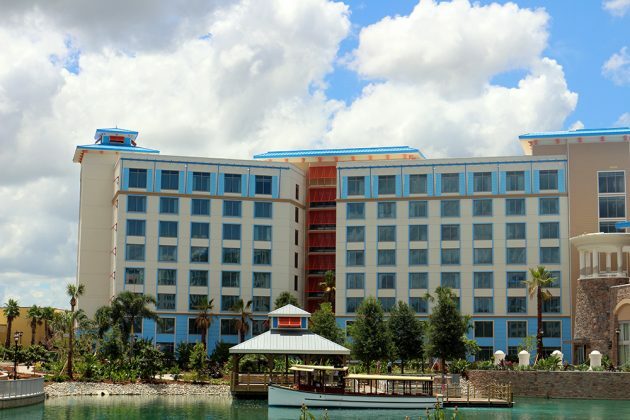 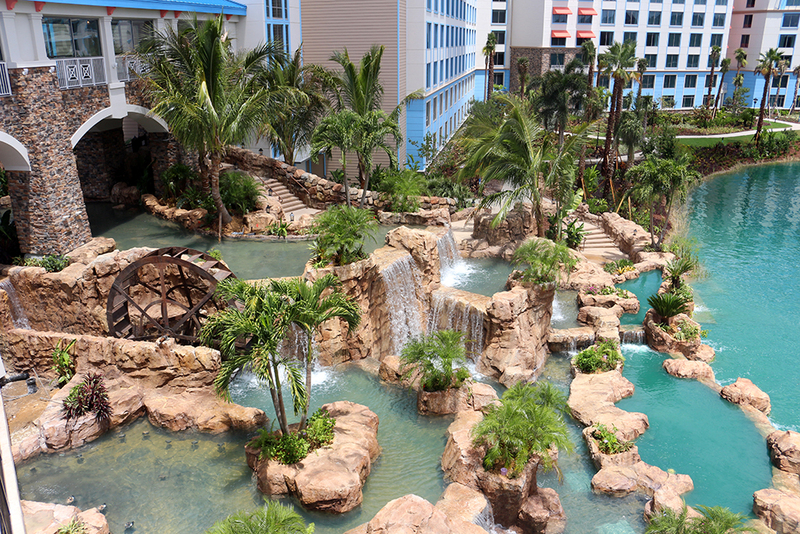 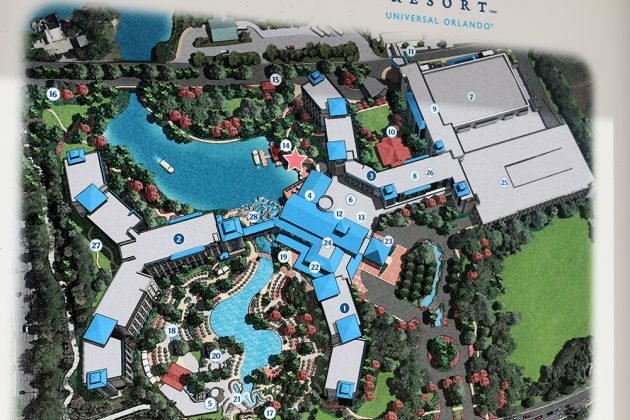 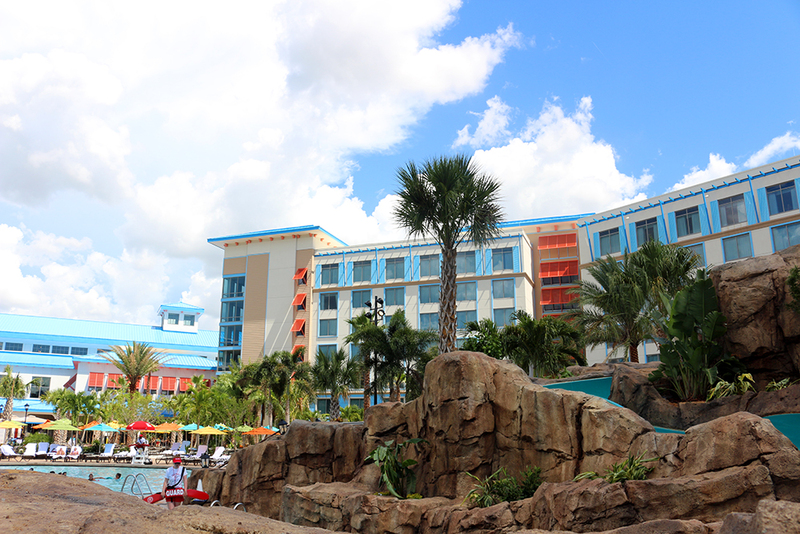 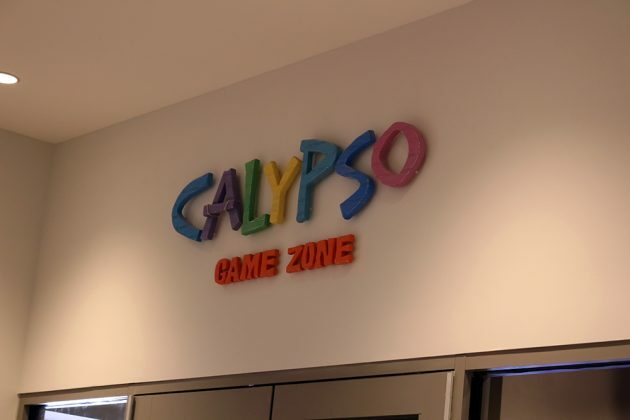 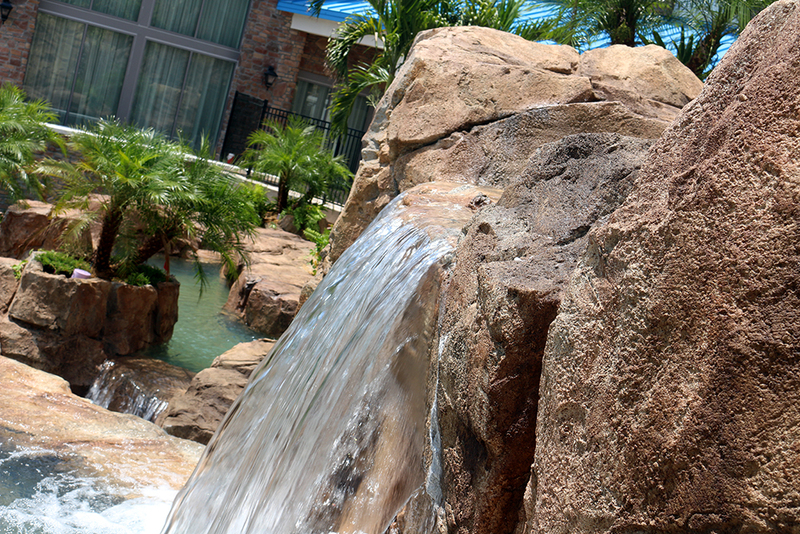 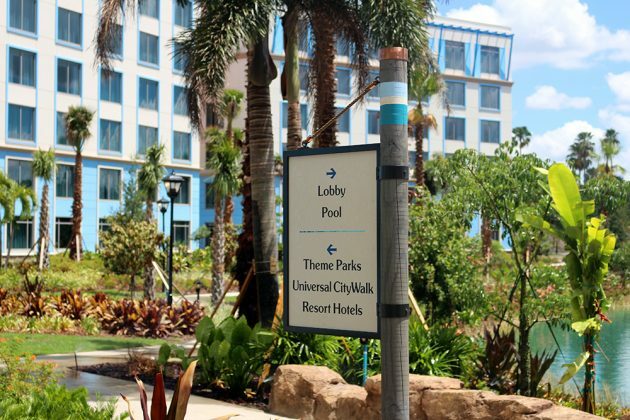 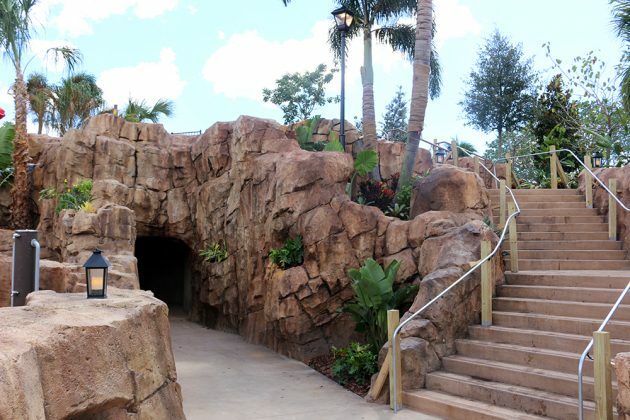 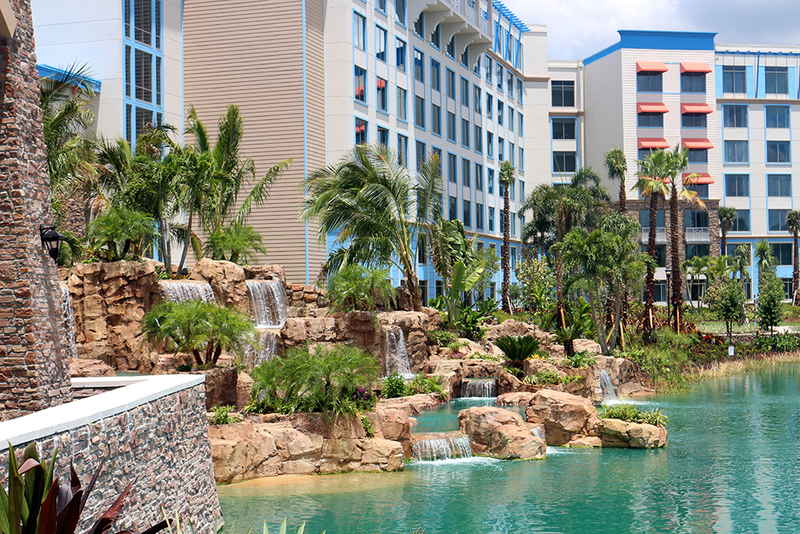 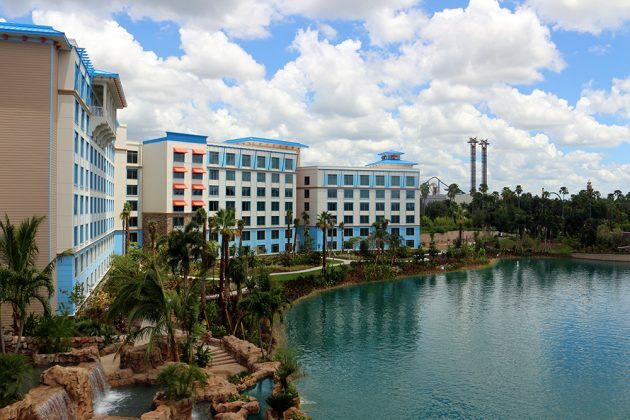 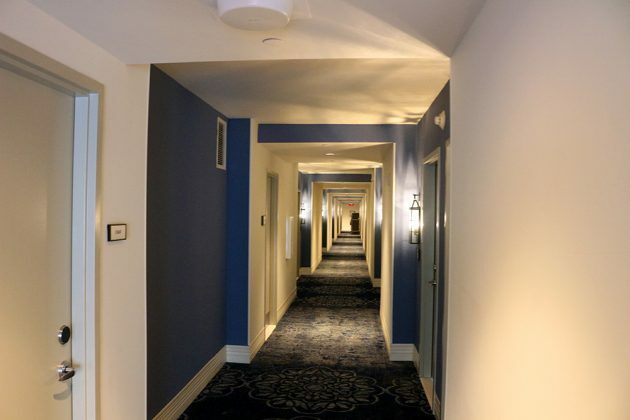 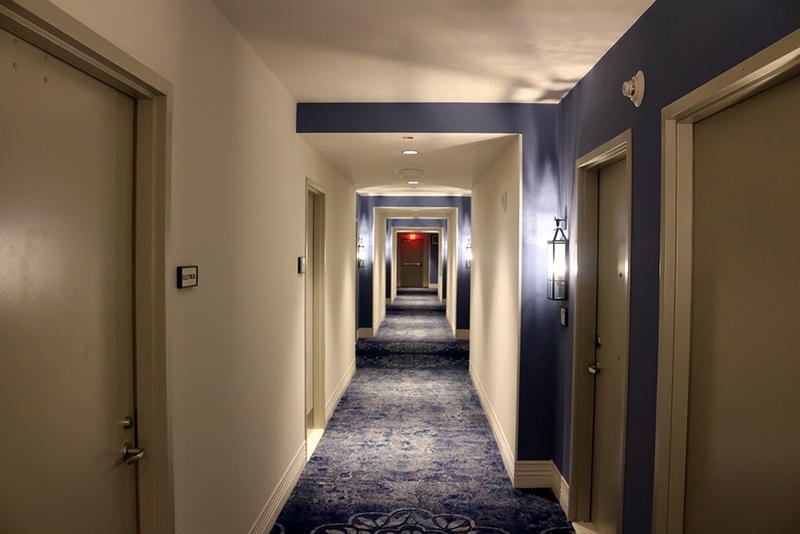 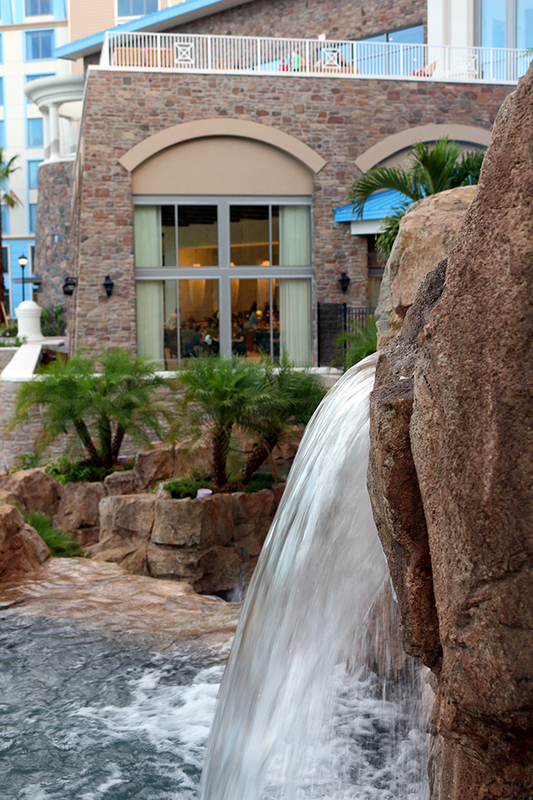 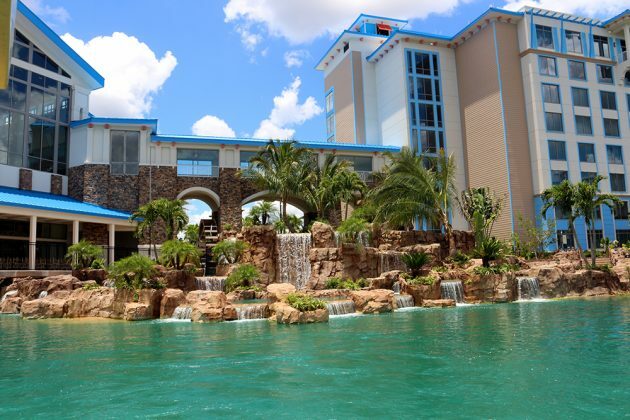 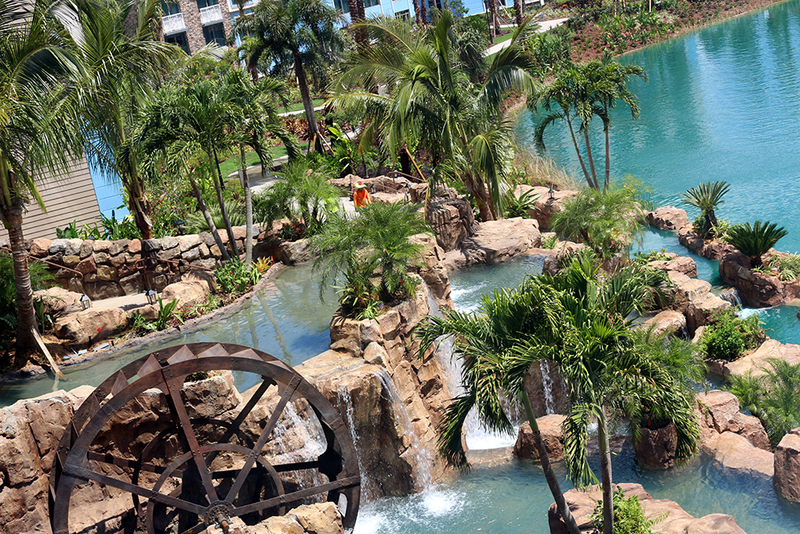 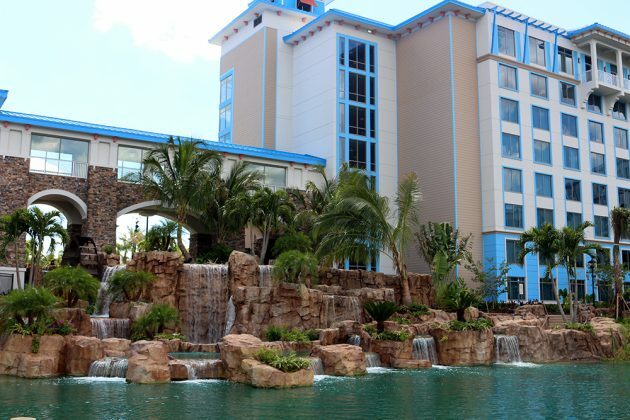 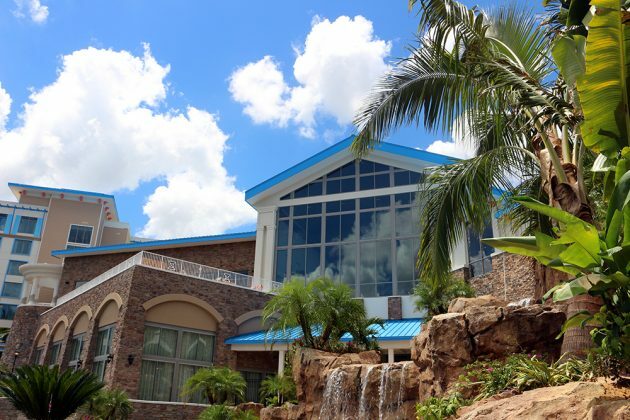 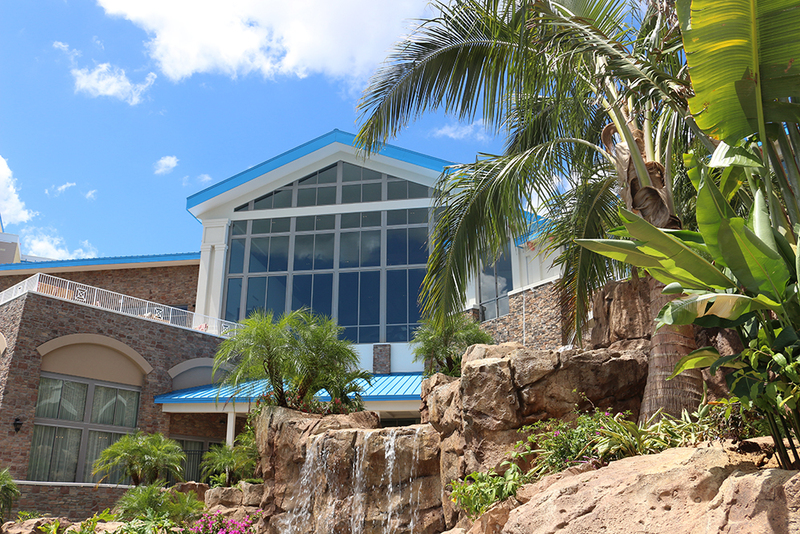 The Caribbean-themed resort features 1,000 rooms, including 77 suites, which brings the number of on-site hotel rooms at Universal Orlando to 5,200. 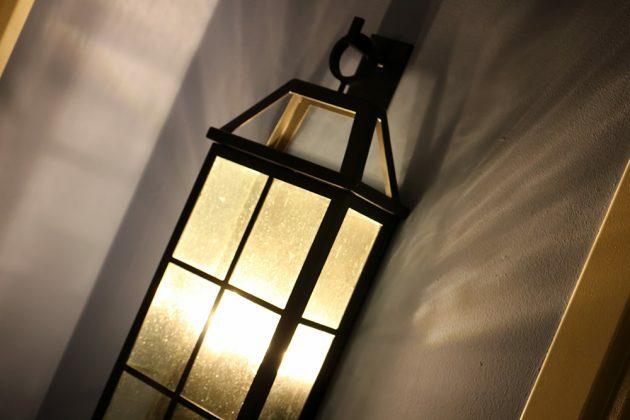 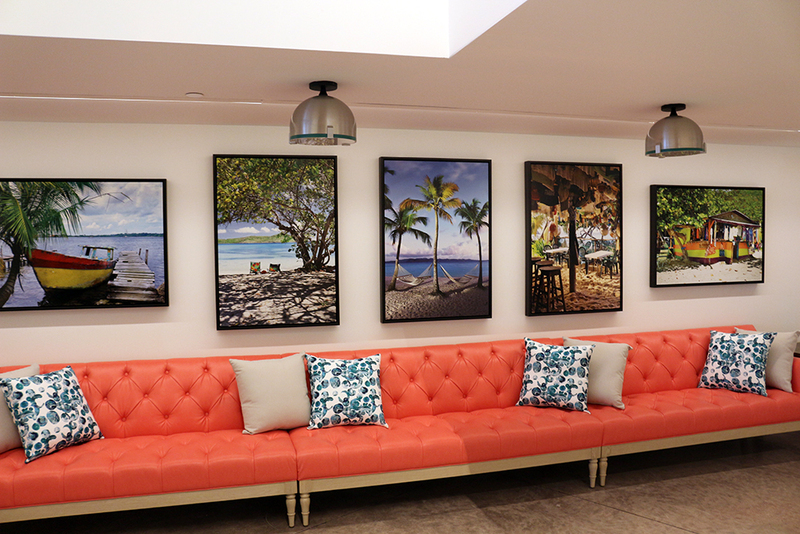 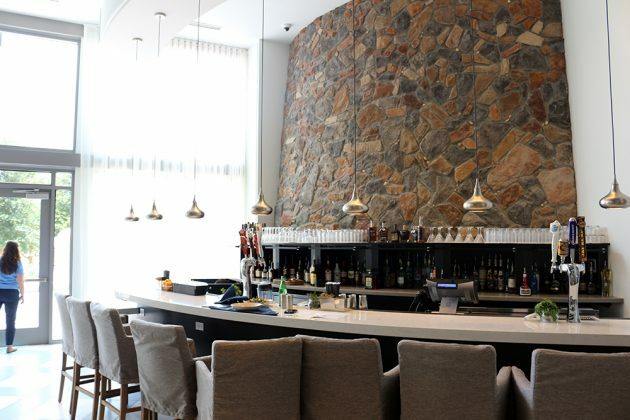 Taking inspiration from tranquil water features along with Old-Era Caribbean; many influences come from the old rum era, with the styles of a new modern hotel. 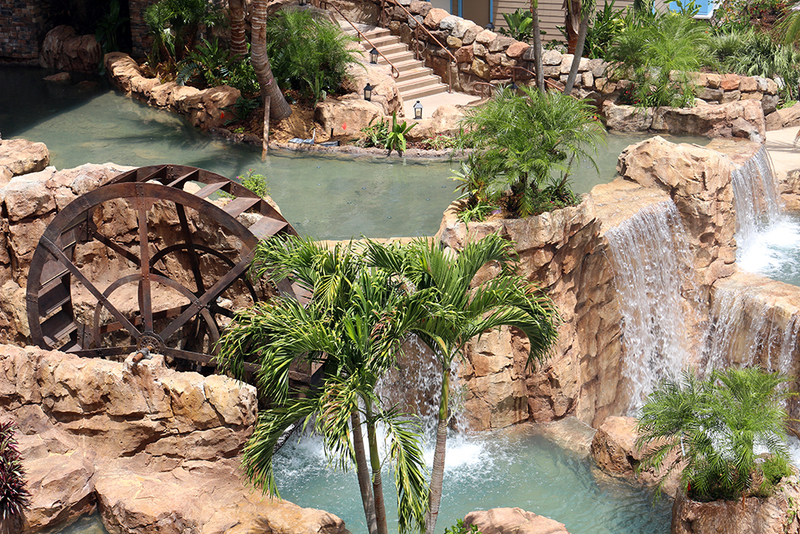 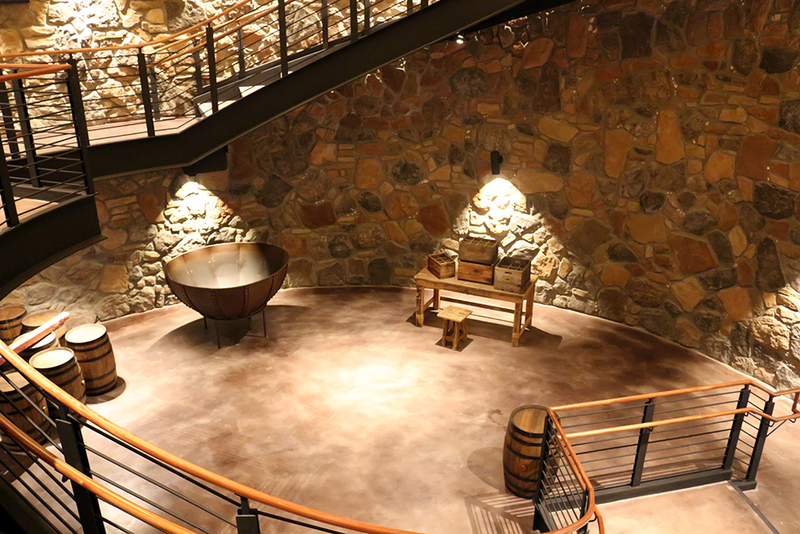 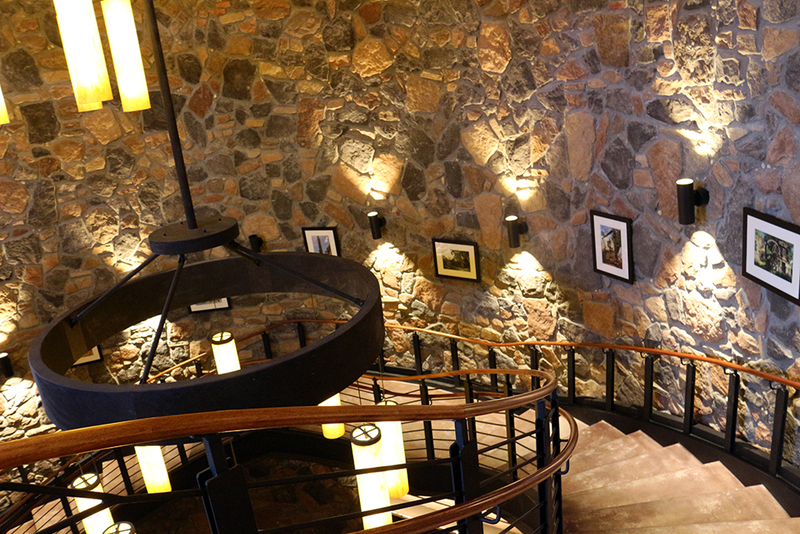 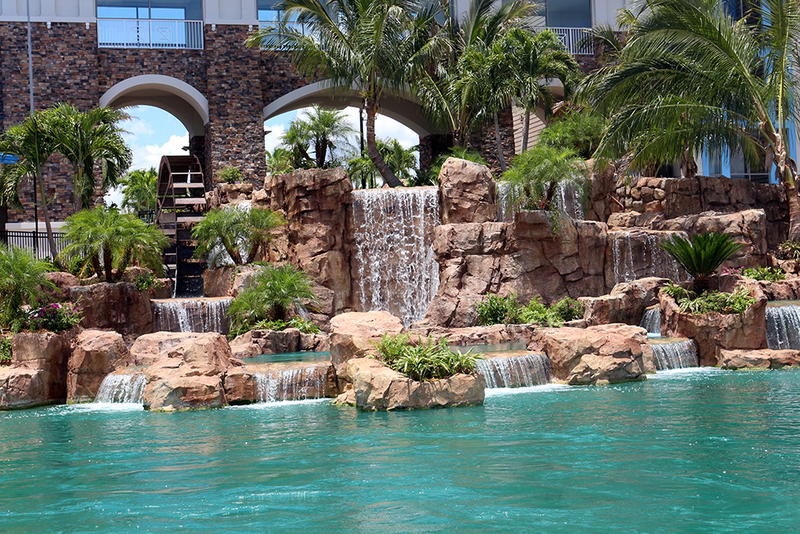 Story goes…The hotel is built over an old age rum distillery in the Caribbean, which also is known for its peaceful water features and waterfalls. One of the biggest areas of the resort is still under construction, with the Convention Center not ready at the time of opening. 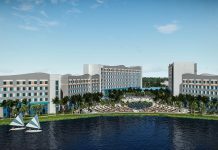 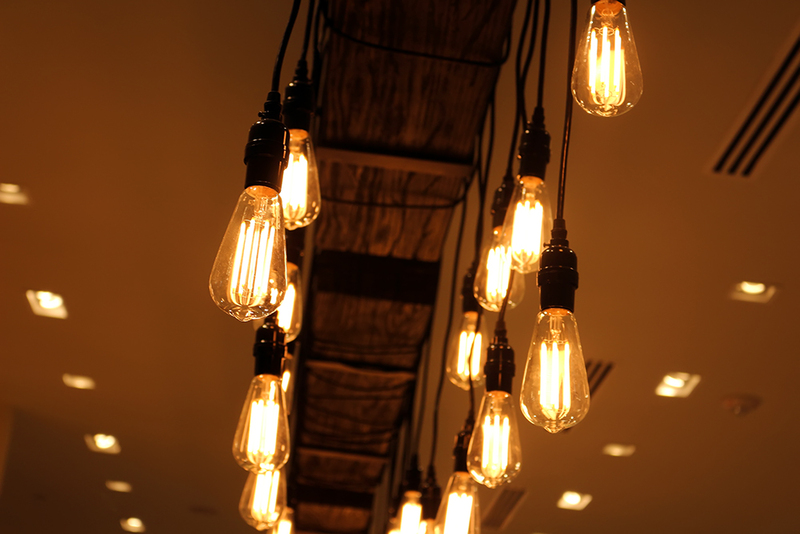 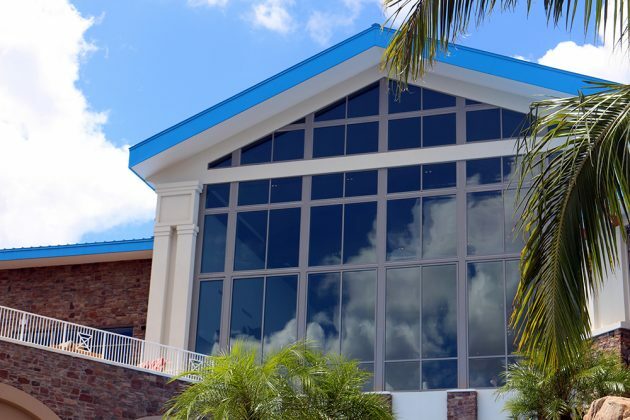 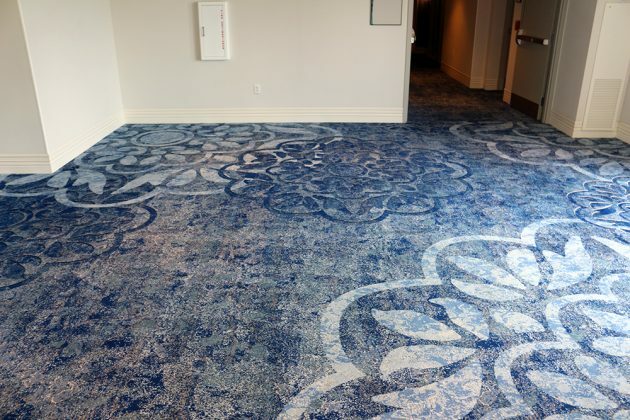 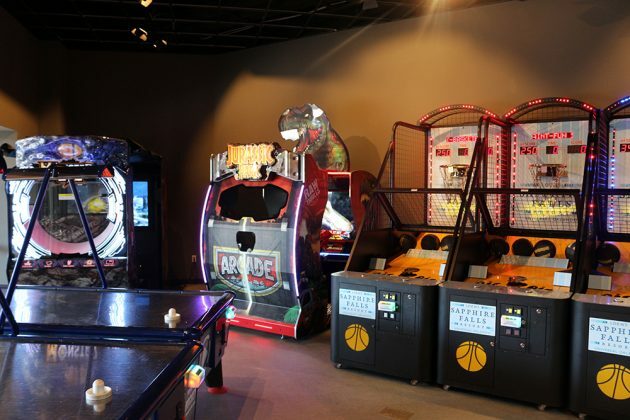 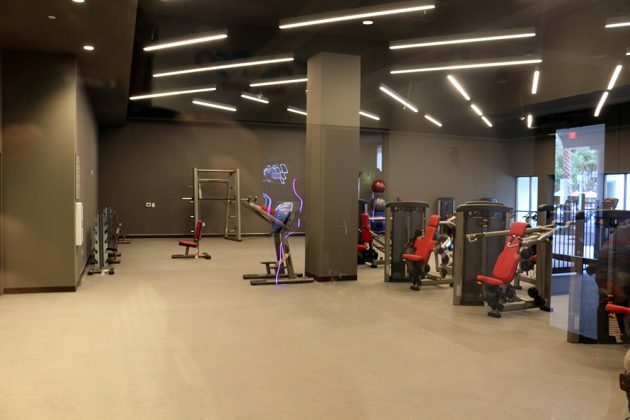 Once completed, the Convention Center will feature 115,000 square feet of meeting and function space and connect to the adjacent Royal Pacific Resort. So the basics: Amenities include Early Park Admission to Universal’s theme park, as well a free Wi-Fi. 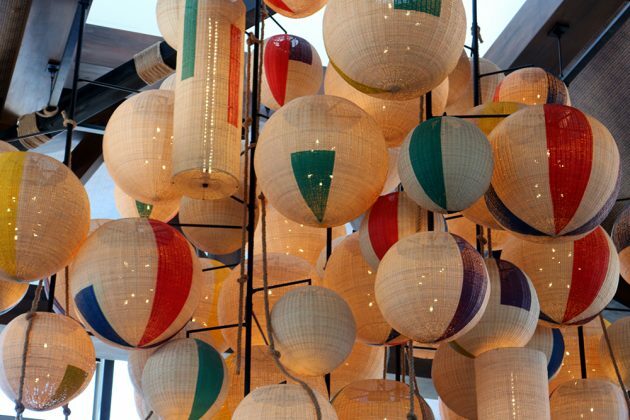 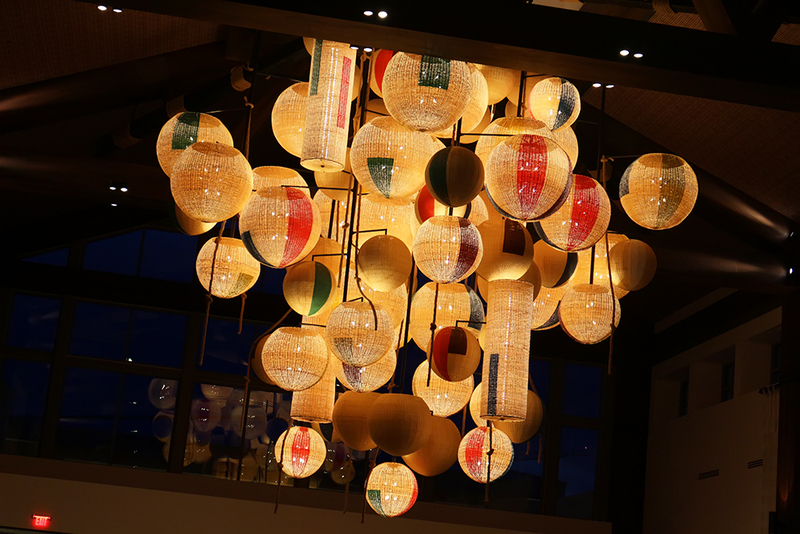 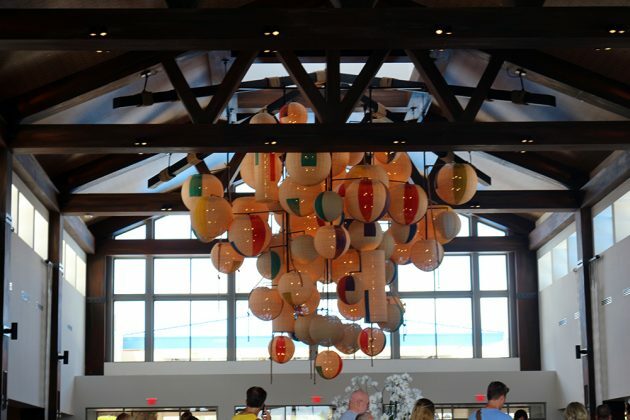 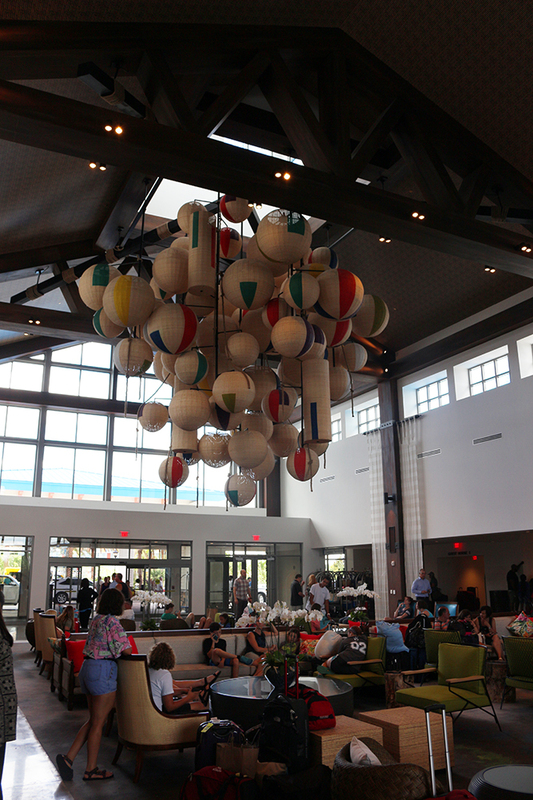 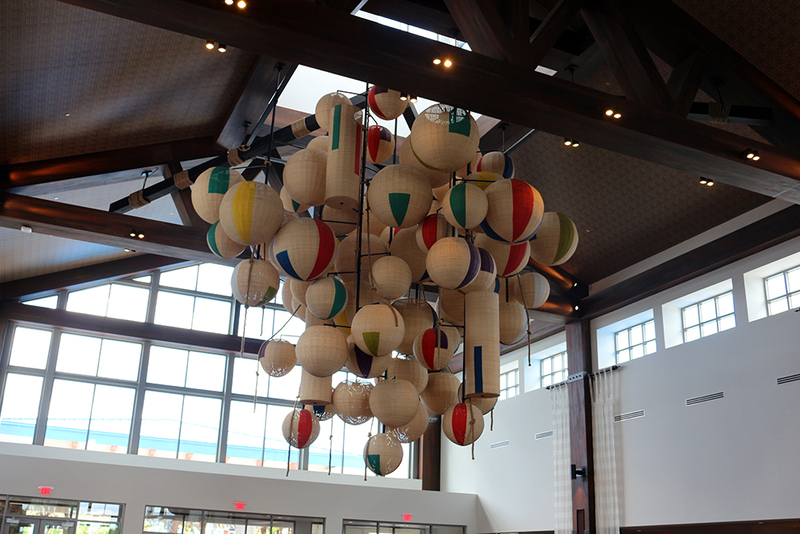 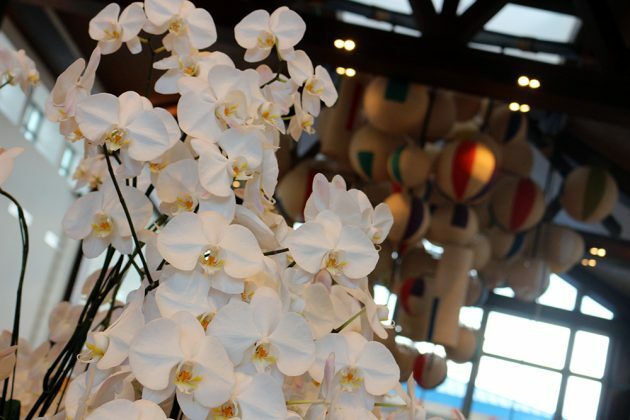 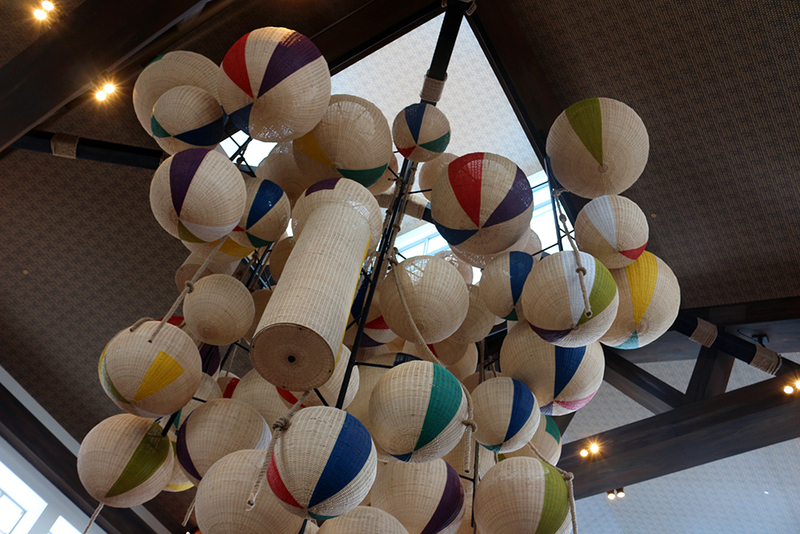 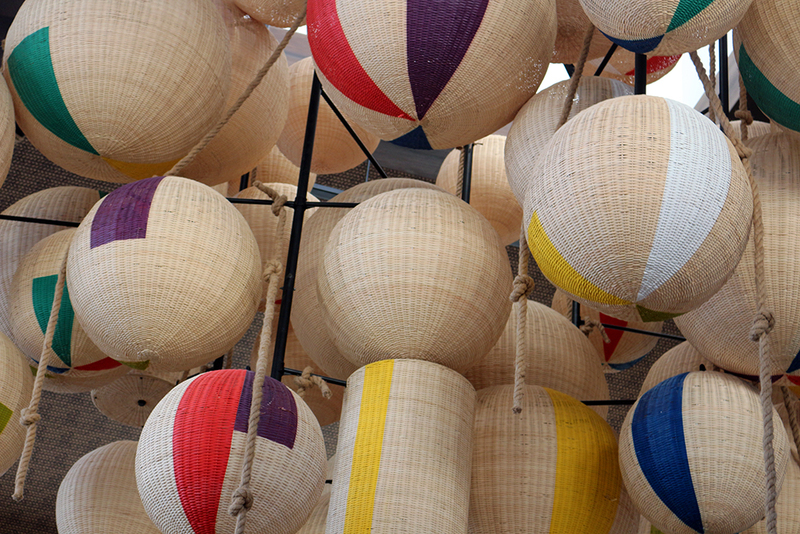 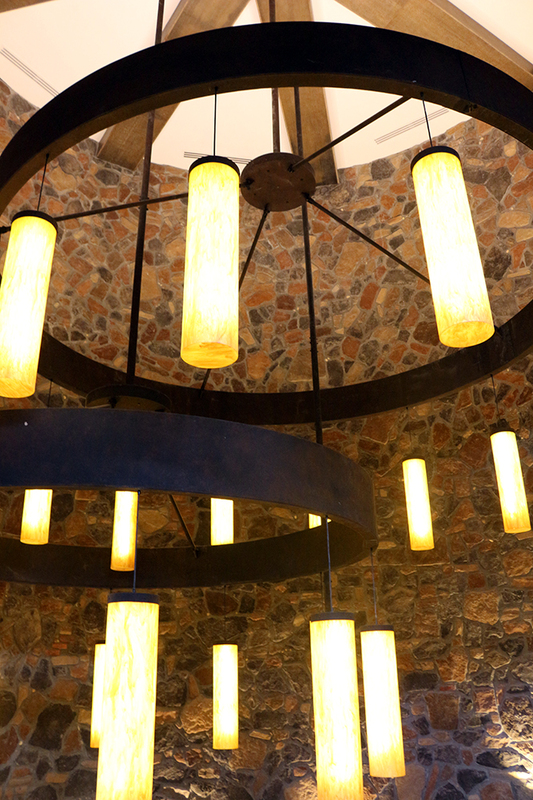 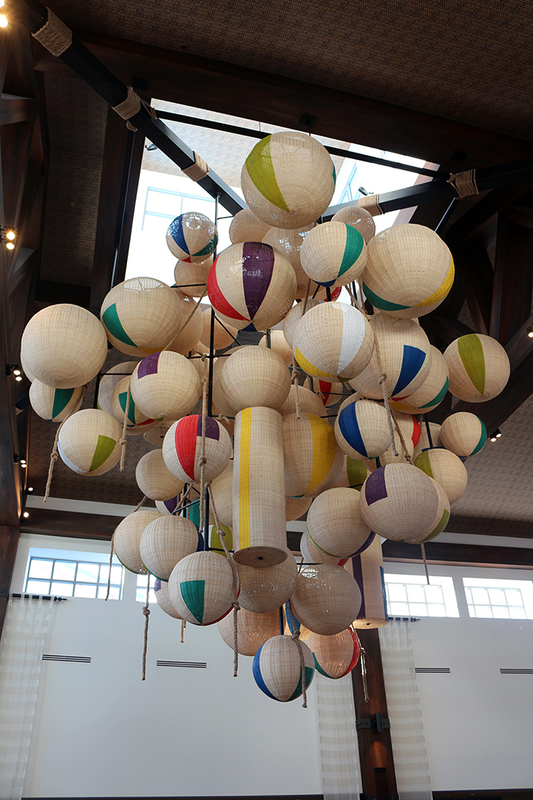 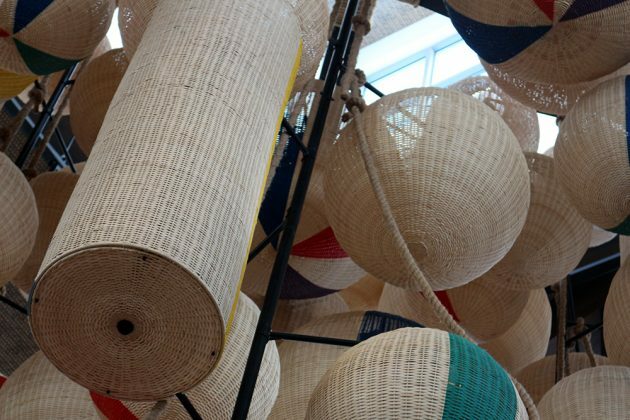 The lobby features a simple, clean yet modern look with a huge wicker-style “Beach Ball” chandelier as the main focal point. 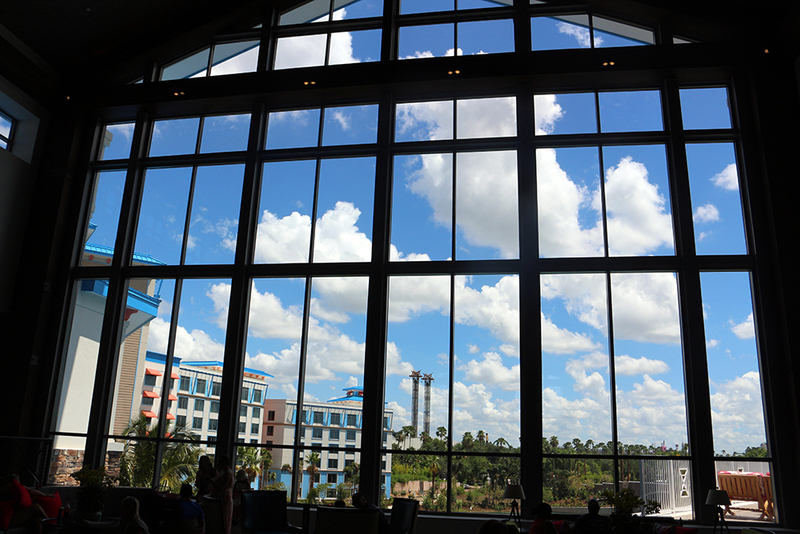 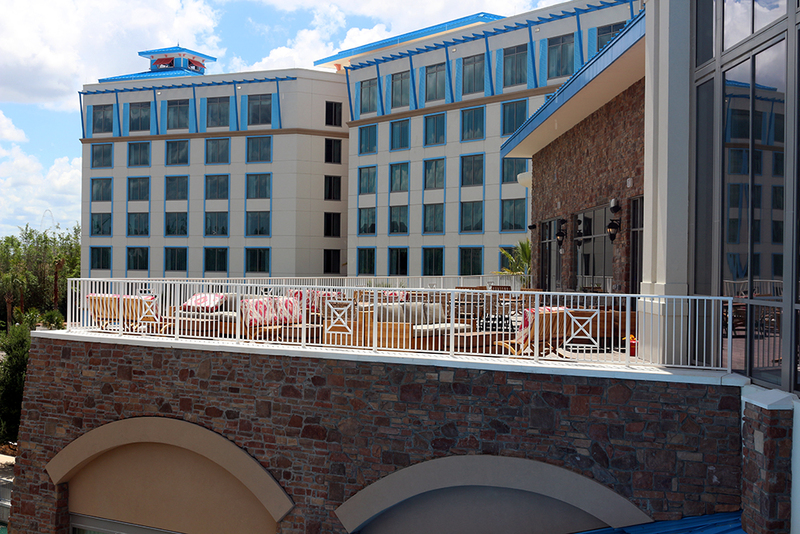 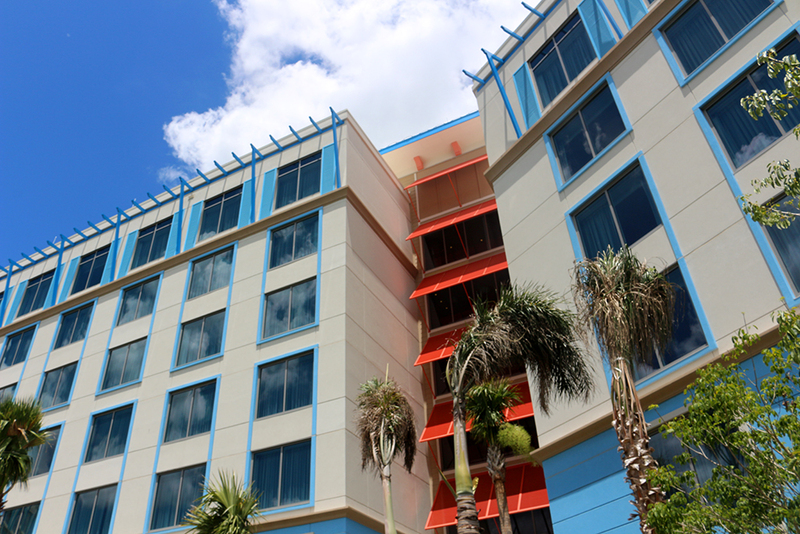 On the opposite end, a giant window looks out onto the Resort; featuring a fantastic view of the waterway, Islands of Adventure, and Royal Pacific. 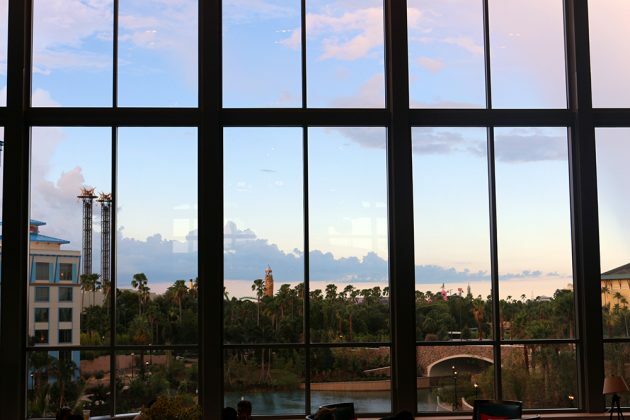 One of the best views on property. 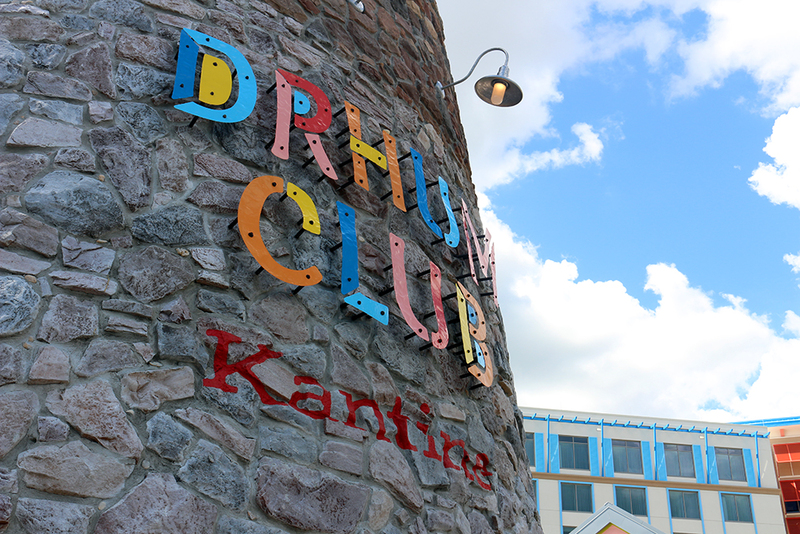 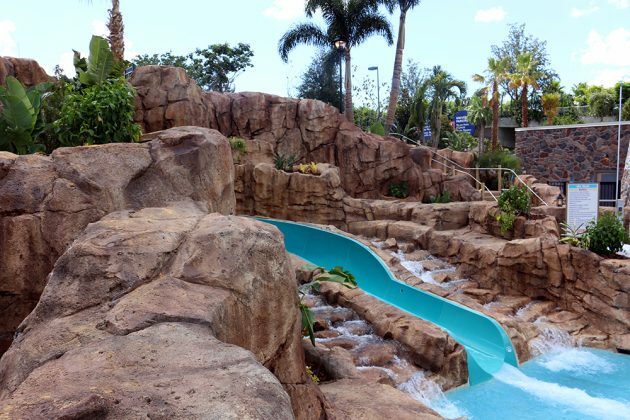 The resort-style pool features a water slide, children’s play area, sand beach and fire pit; along with one of the resort’s restaurants – Drhum Club Kantine, the outside bar & grill area. 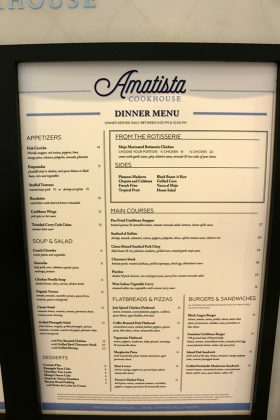 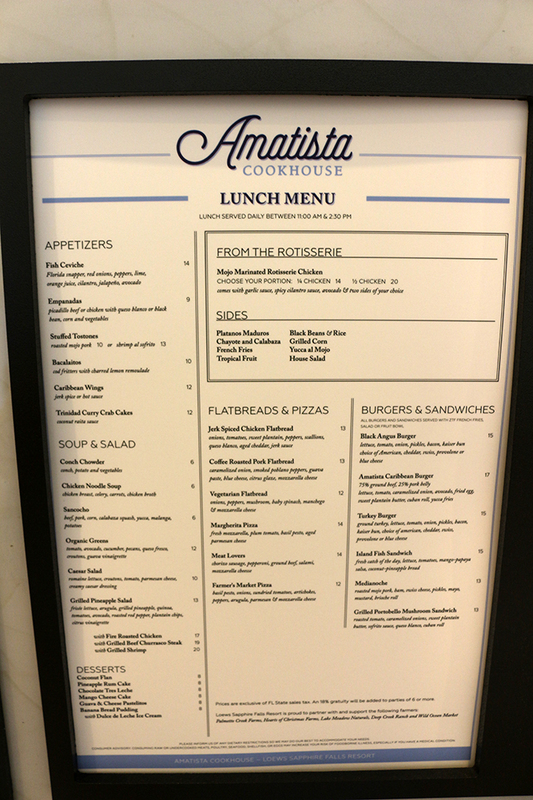 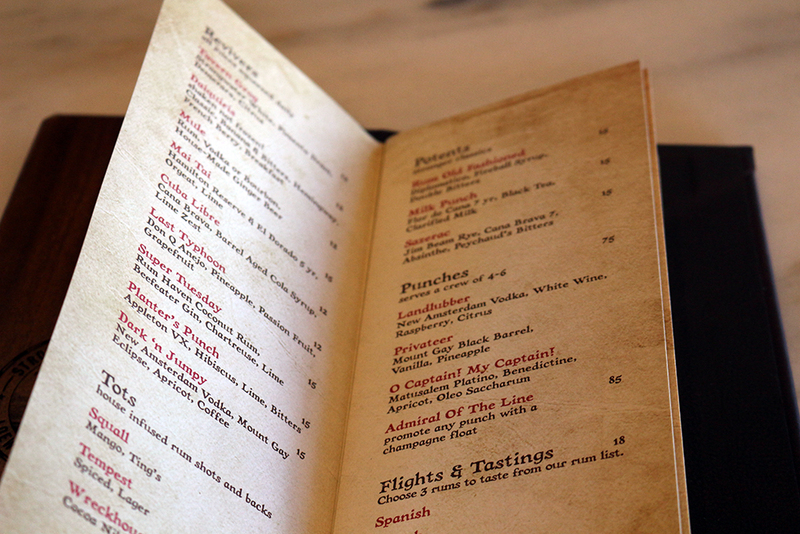 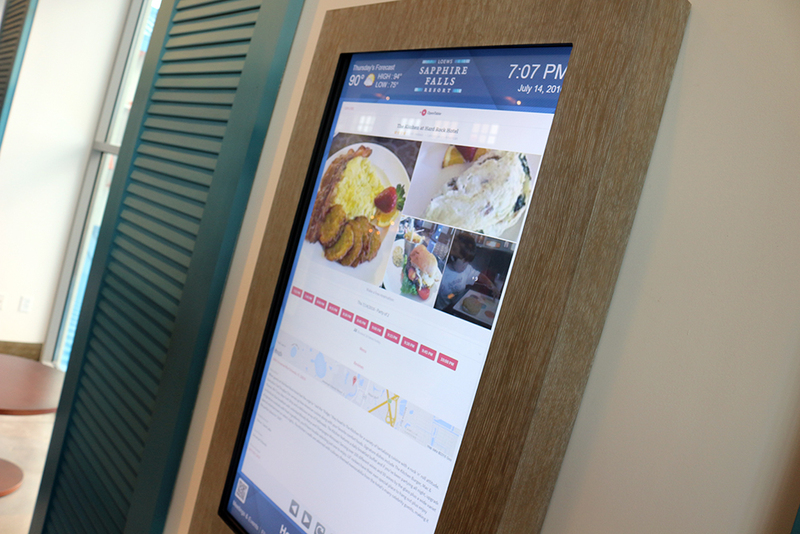 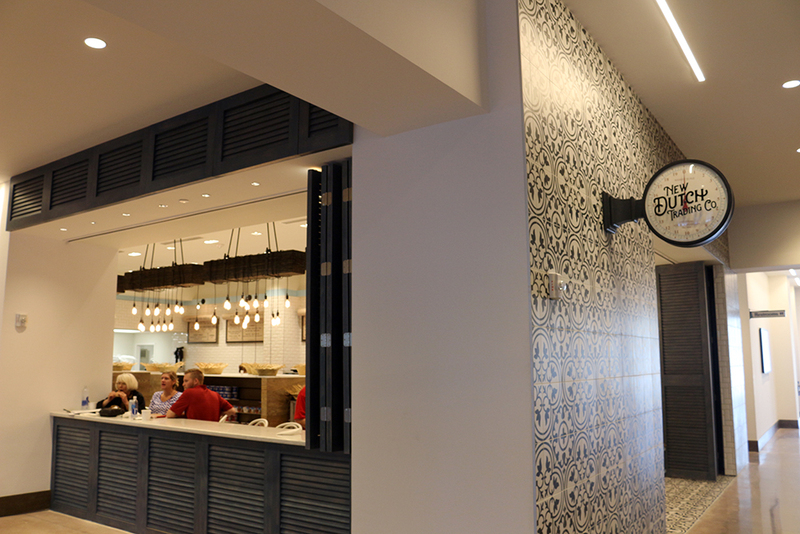 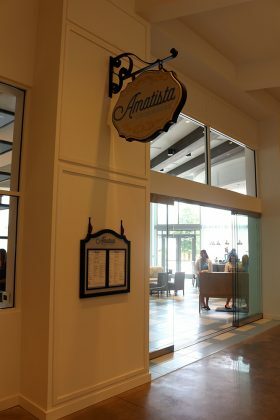 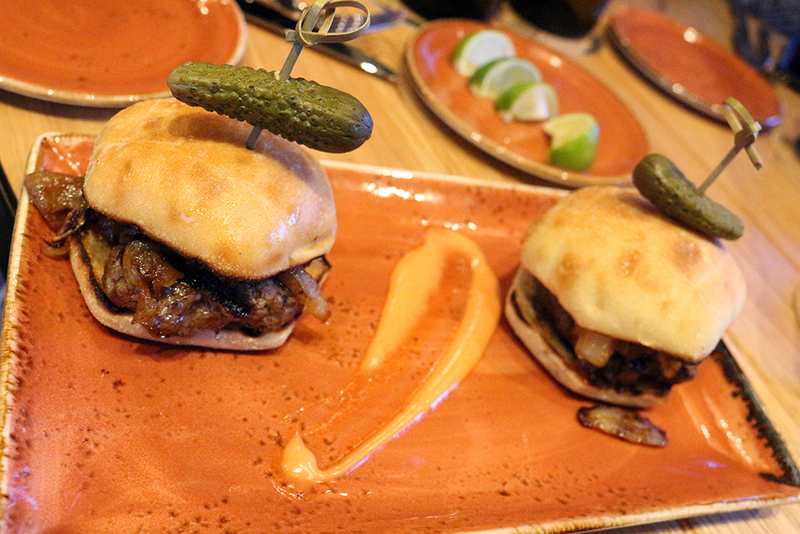 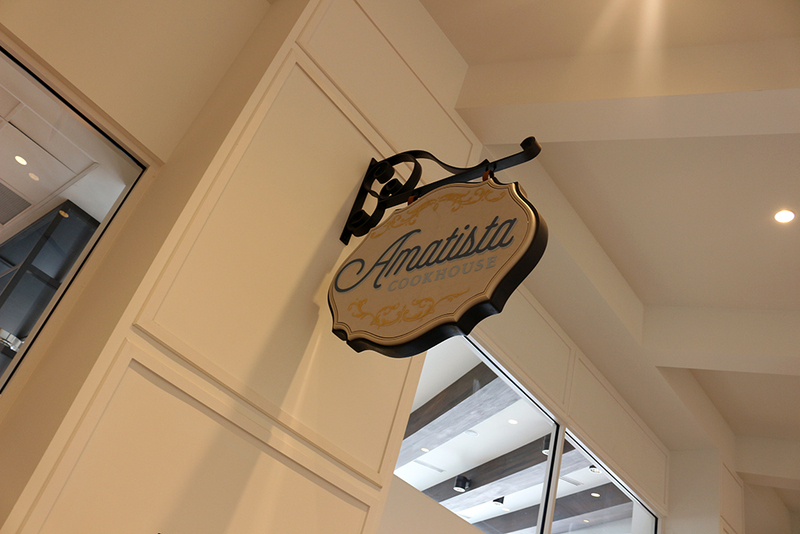 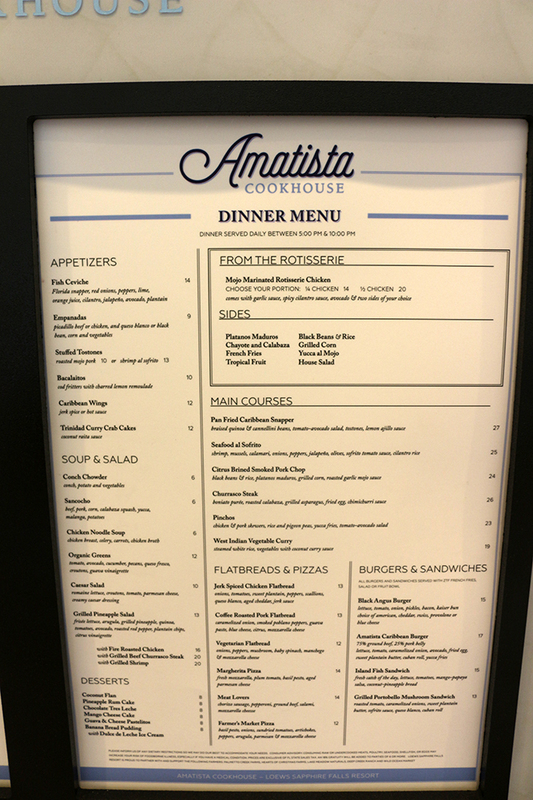 The menu is “tapas-styled” with fresh seafood being the focus of the menu (Yes, they have non-seafood items, too). One of the most surprising aspects of the pool is how little outside noise you hear, considering how close it is to Adventure Way. 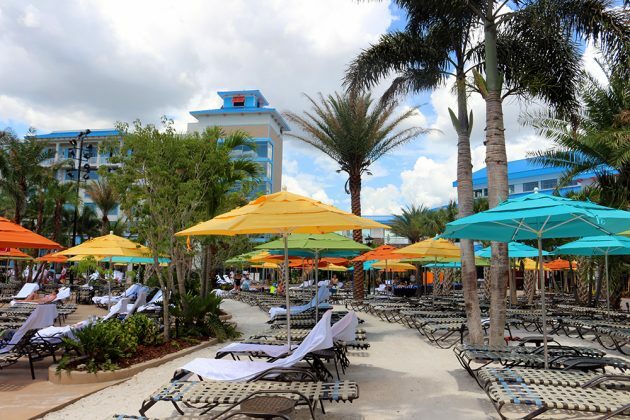 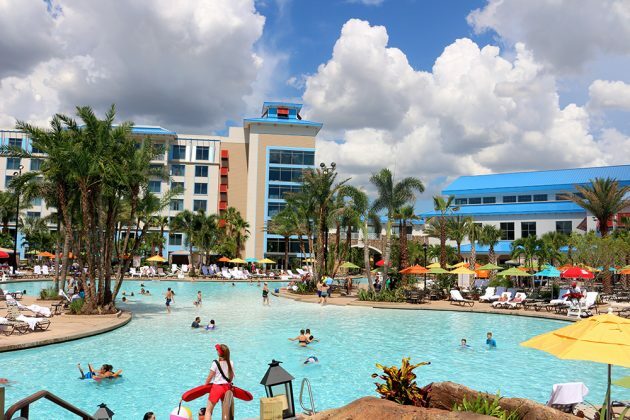 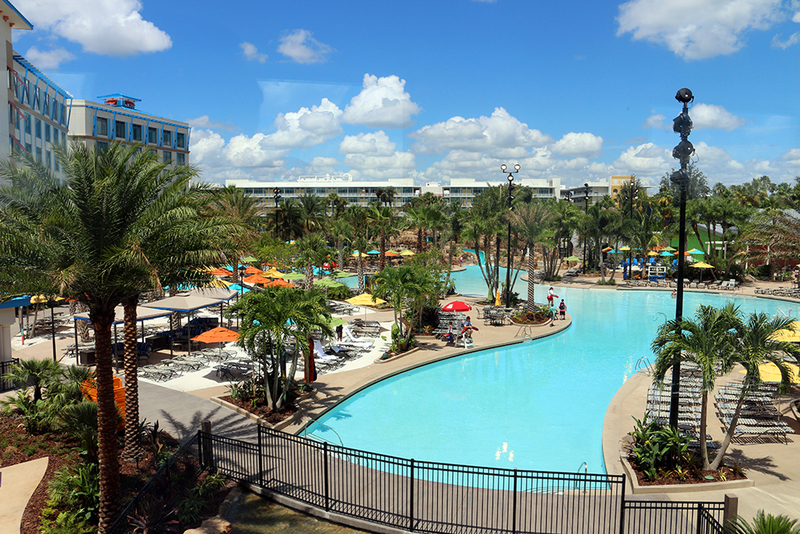 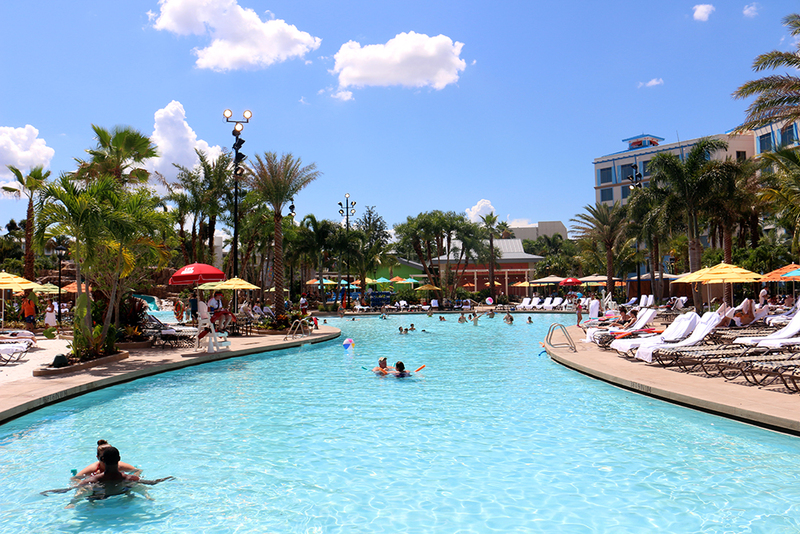 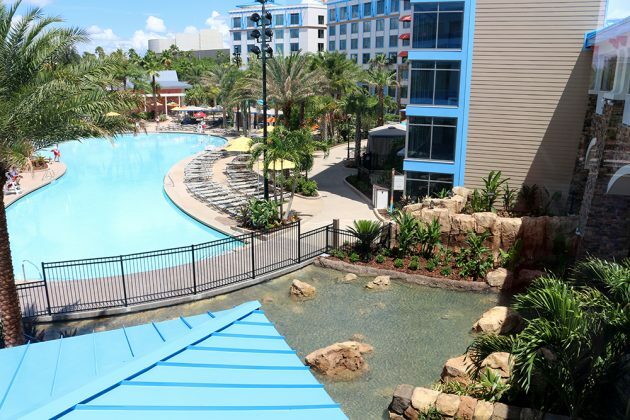 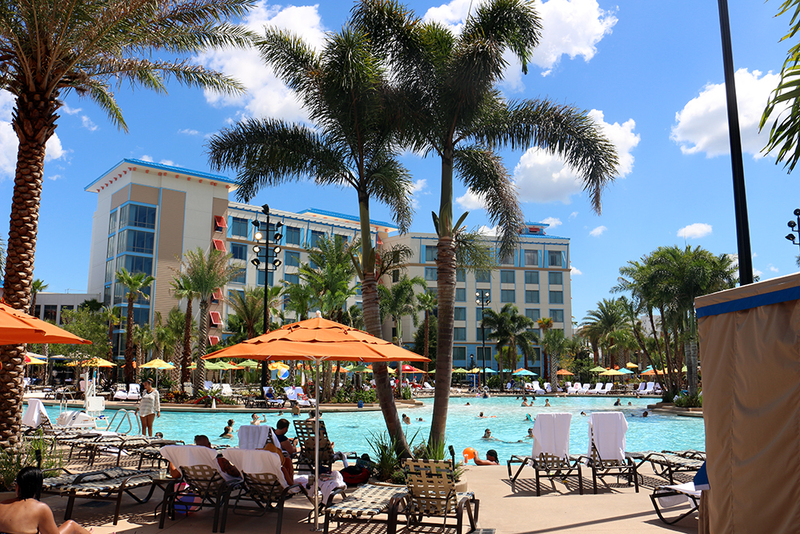 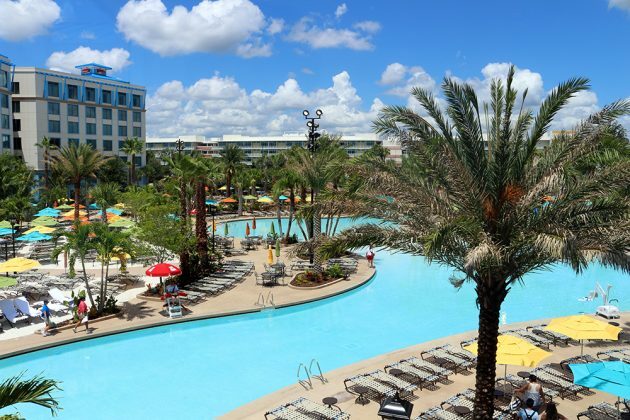 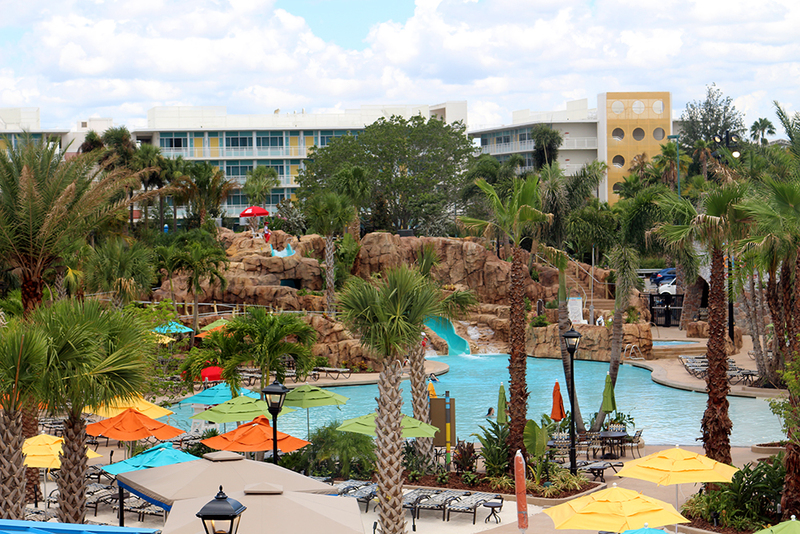 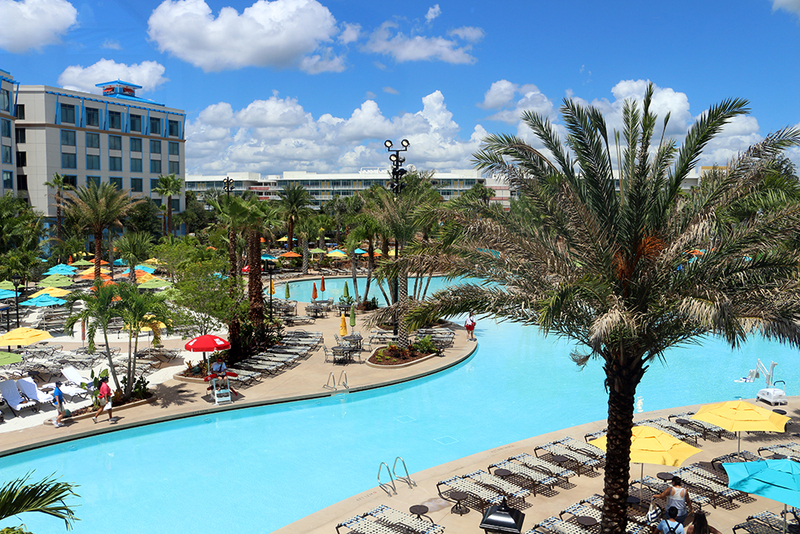 The pool is huge, and is now the largest on-site pool at any of Universal’s 5 resorts – with the surrounding area full of beach chairs and fair amount of private cabanas available for rent. 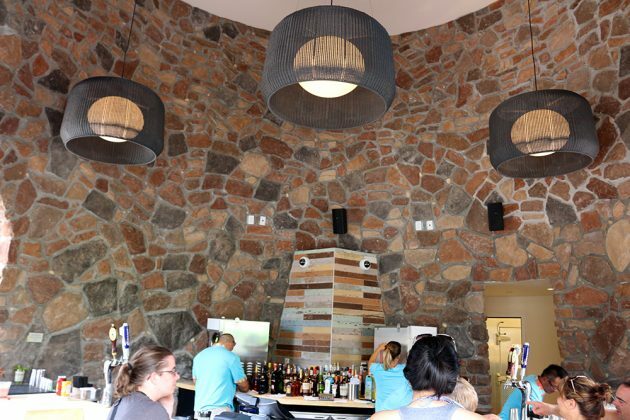 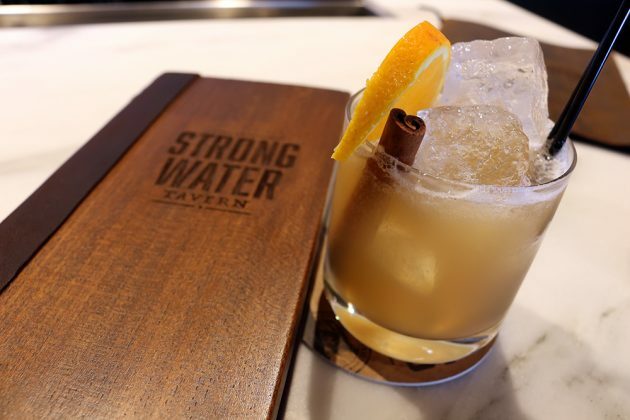 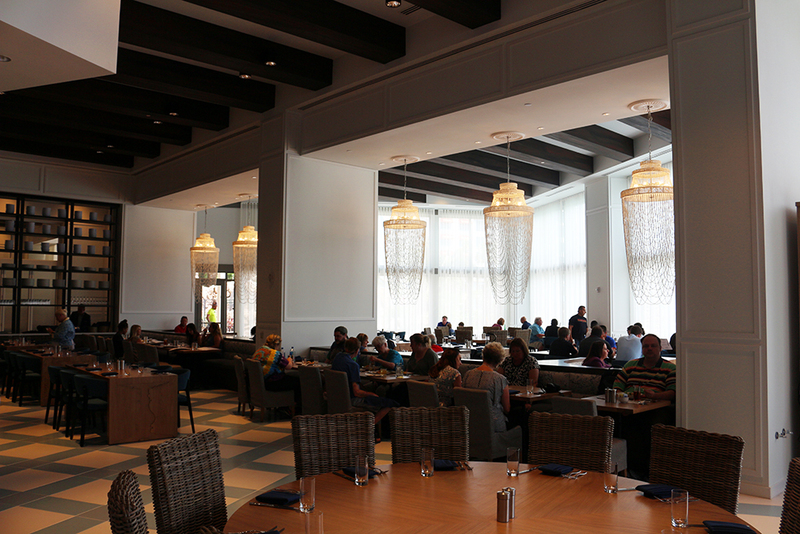 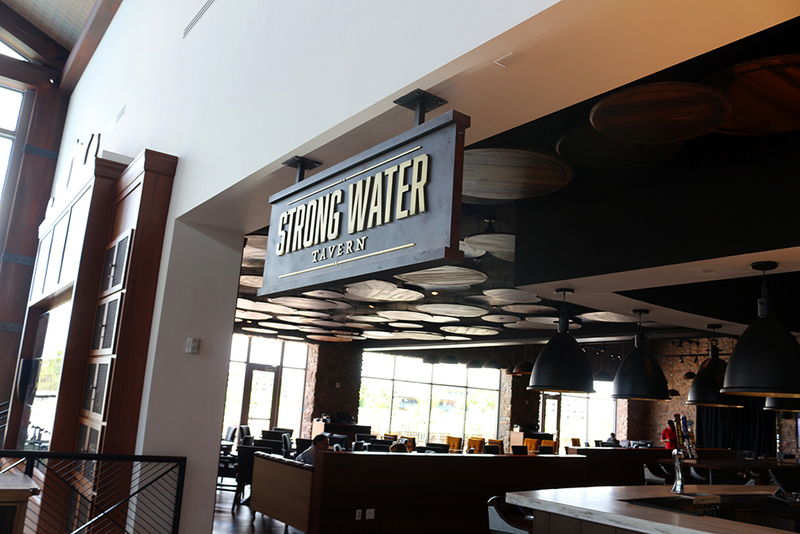 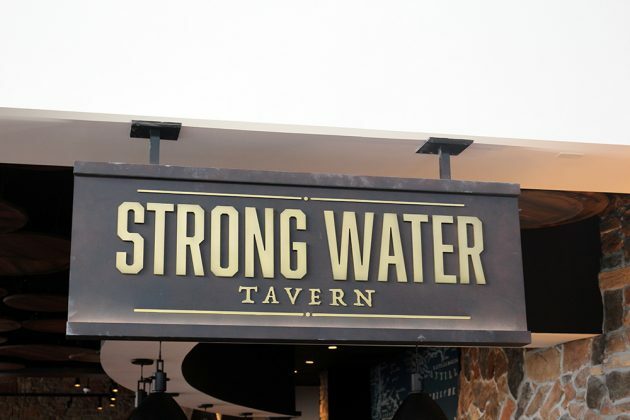 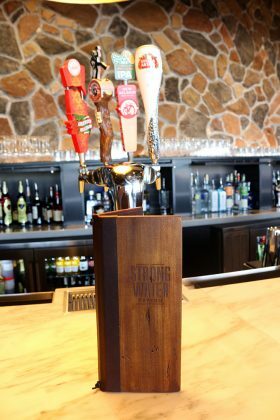 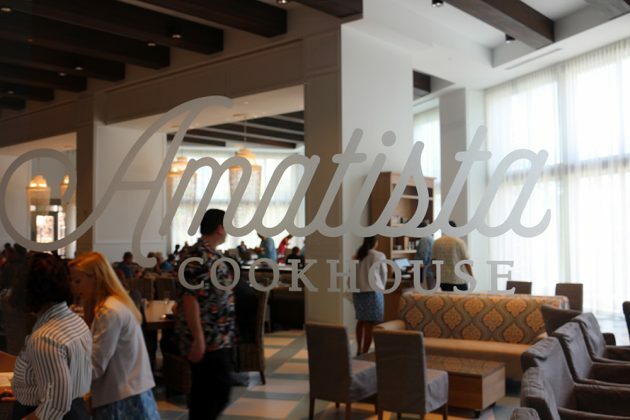 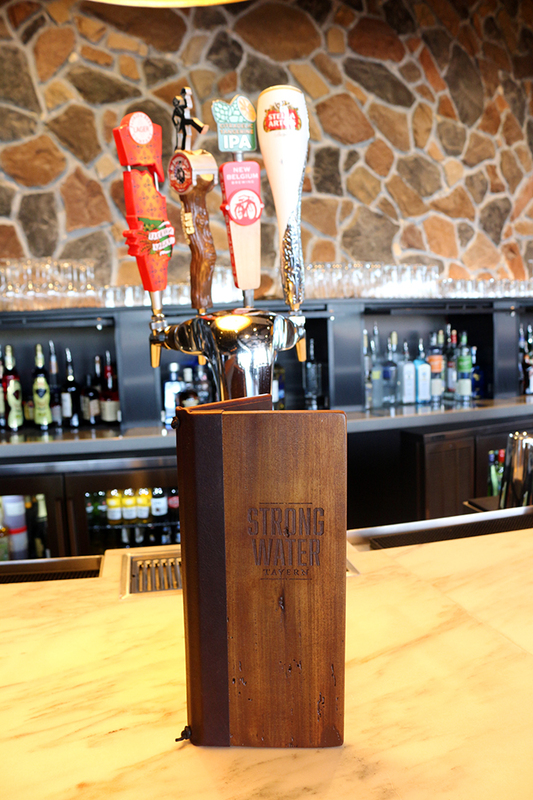 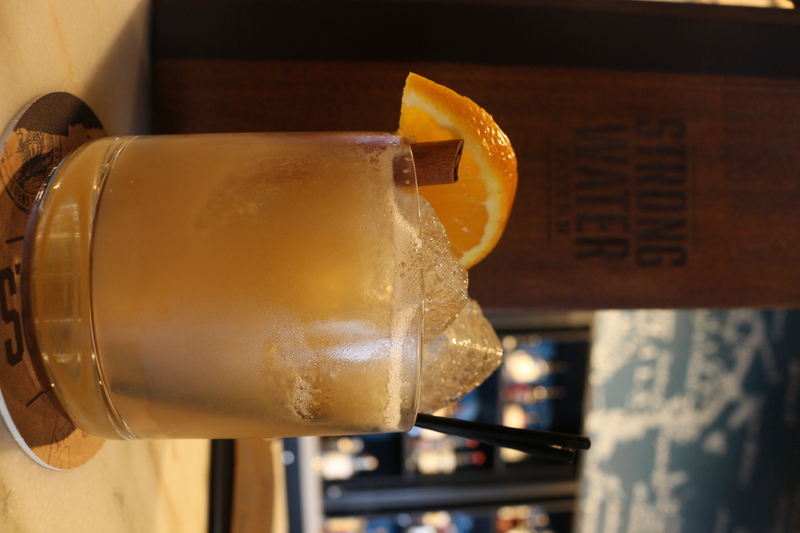 During our visit, we enjoyed a late lunch at Strong Water Tavern, the resort’s lounge/rum bar. 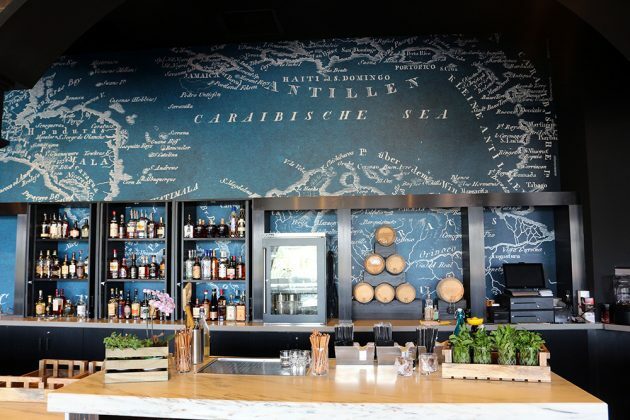 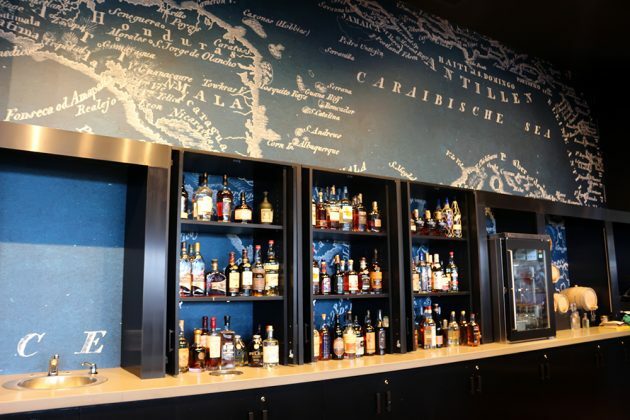 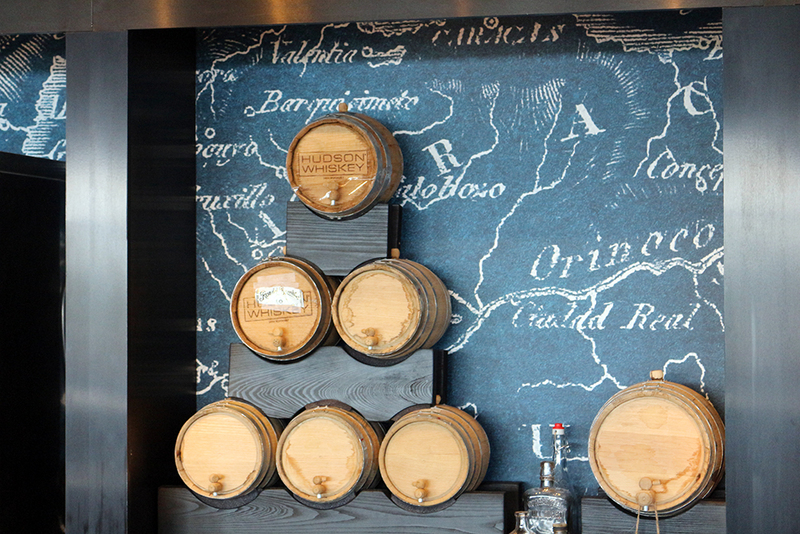 Vintage rums adorn the walls of the bar, with a map of the old trade route of the Caribbean. 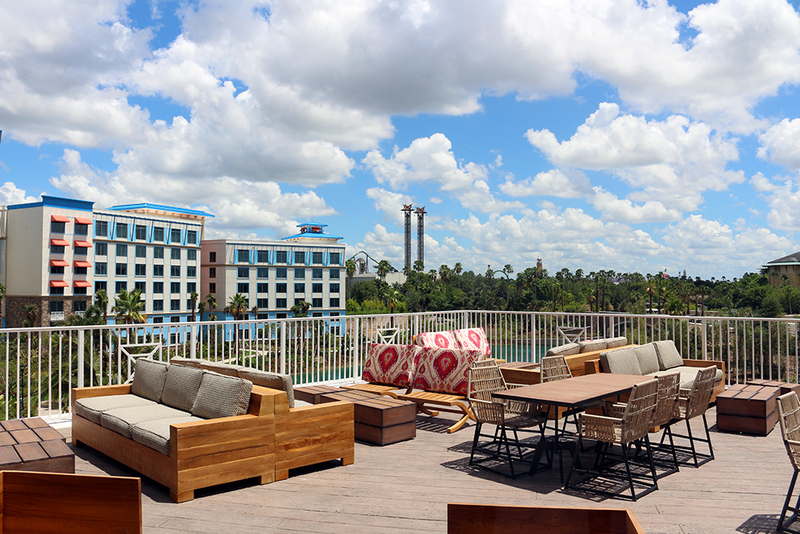 Featuring a ceviche bar, and rum specialists to help with your drink selection, the highlight of the lounge is the patio overlooking the lagoon; offering that fantastic view of the Resort. One of the interesting aspects of the lounge is that a lot of their mixed drinks are freshly-made to order, i.e. their Grog isn’t pre-mixed, it’s mixed when ordered. 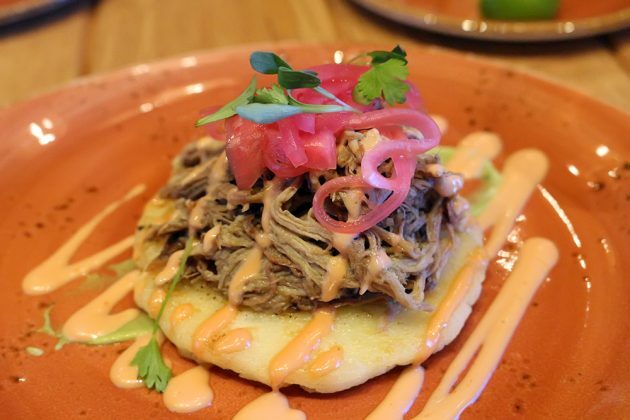 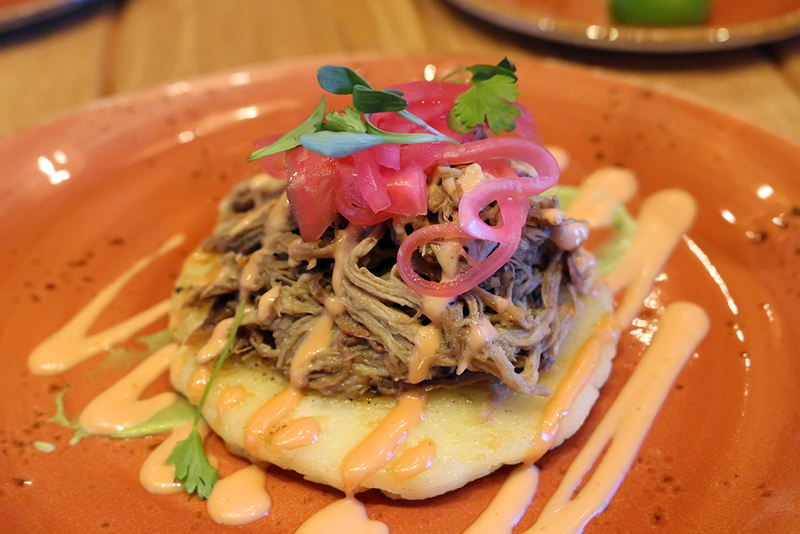 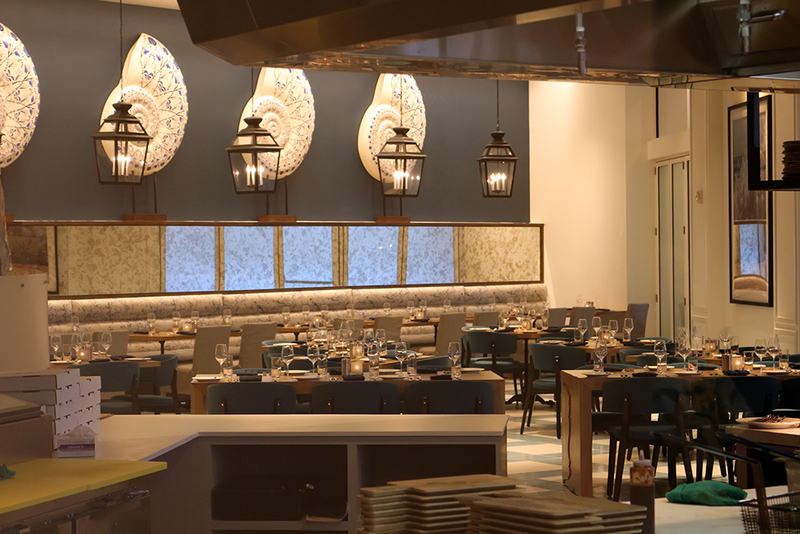 Serving lunch and dinner, with daily rum tastings, the menu features “tapas-style” with their signature dish being ceviche. 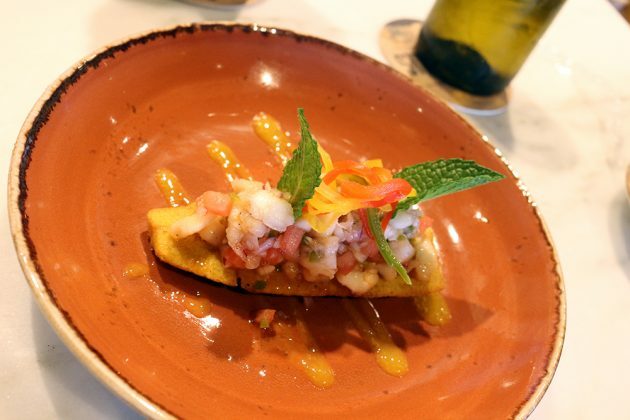 Featuring 4 different types, we tried the Cuban Mojito Ceviche – which includes sea bass, jalapeno, mint, and more atop a fried plantain. 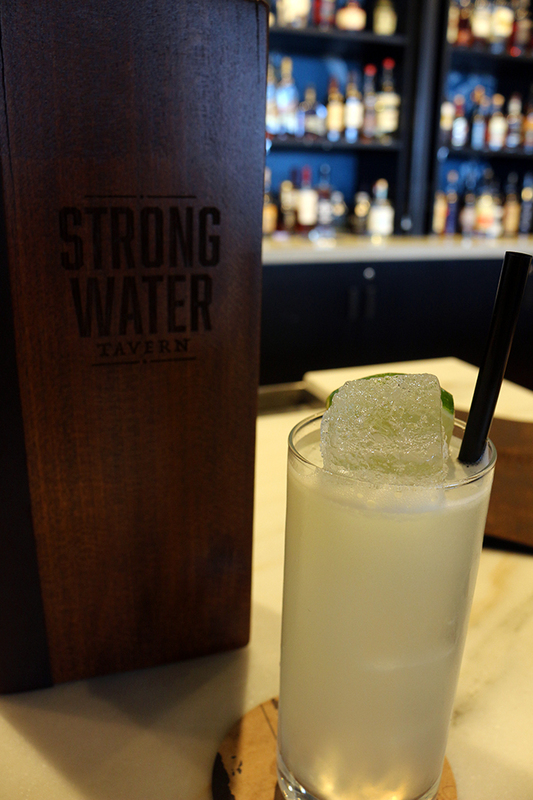 What we enjoyed was that the seafood was the star of the dish and wasn’t overpowered by the acidity of the lime. 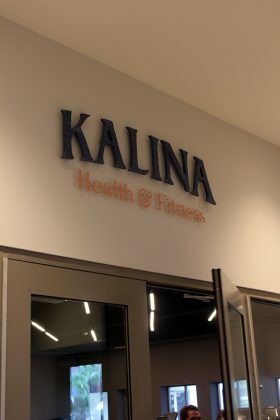 The mint adds a nice fresh hint as well. The signature drink – The Tavern Grog – seems to be a twist on the renowned Royal Navy grog; substituting the lime juice with orange juice. 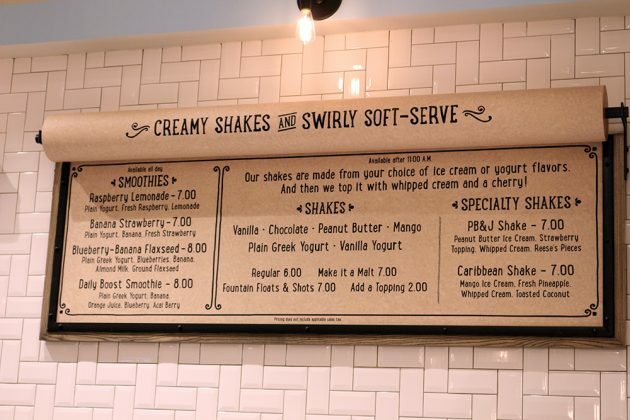 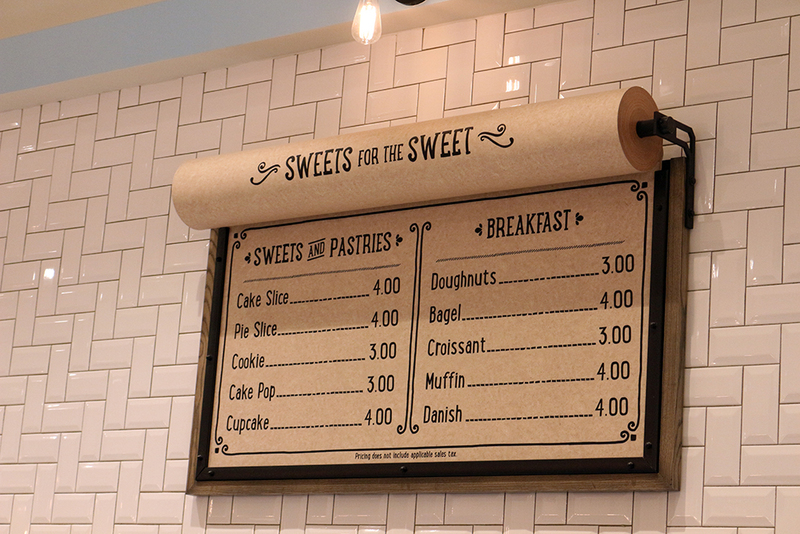 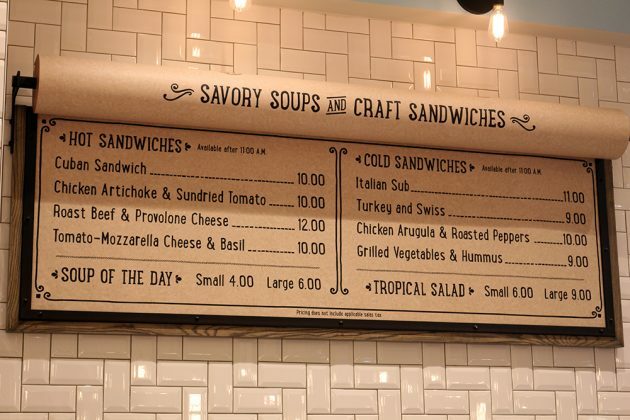 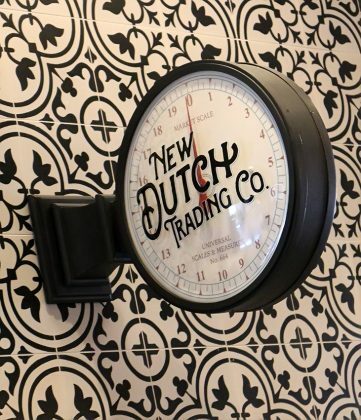 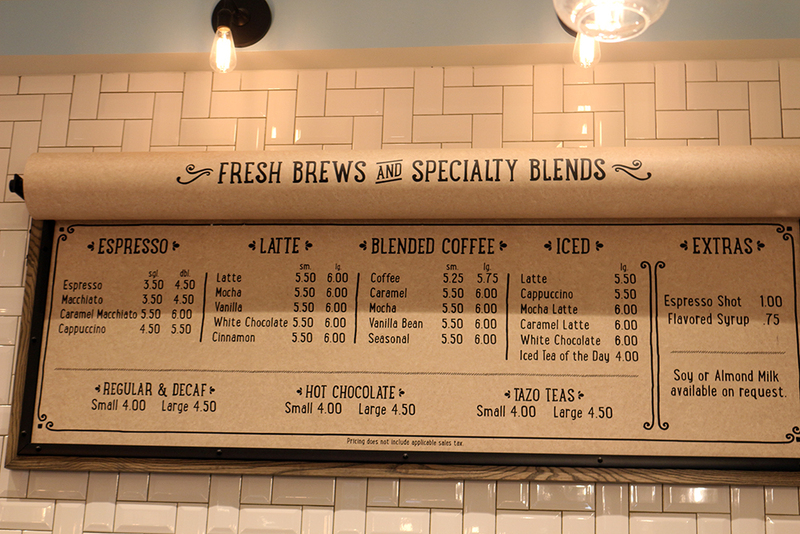 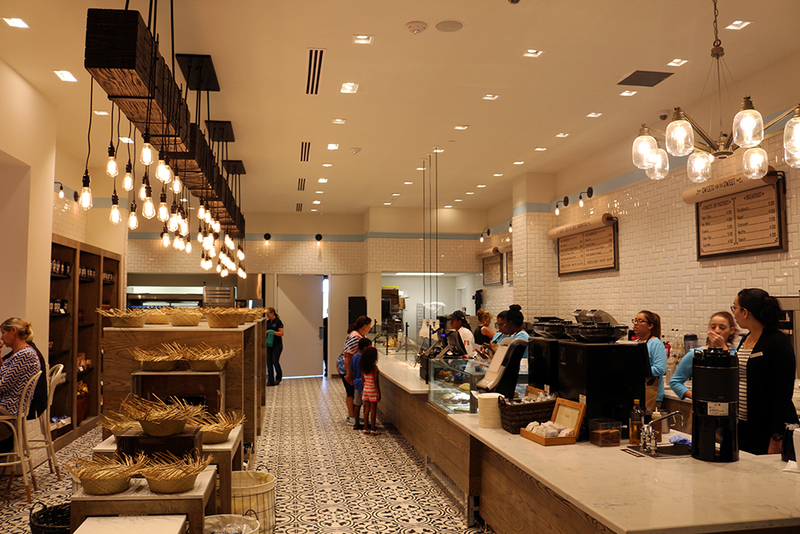 If you’re looking for quick, grab-n-go options; the New Dutch Trading Co. offers that, as well as shakes and coffees. They also sell many of the rubs, spices and sauces that can be found at each of the 4 restaurants. 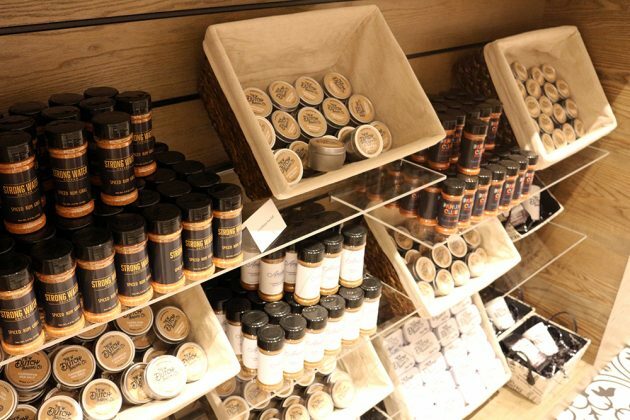 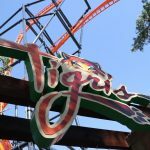 In addition, they sell ready to go meals, beverages, fresh-baked breads and homemade jams, and basic grocery needs for guests. 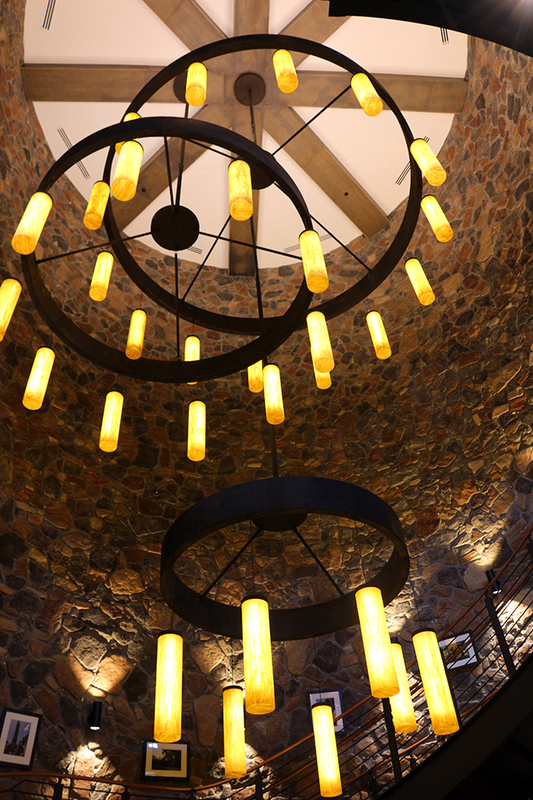 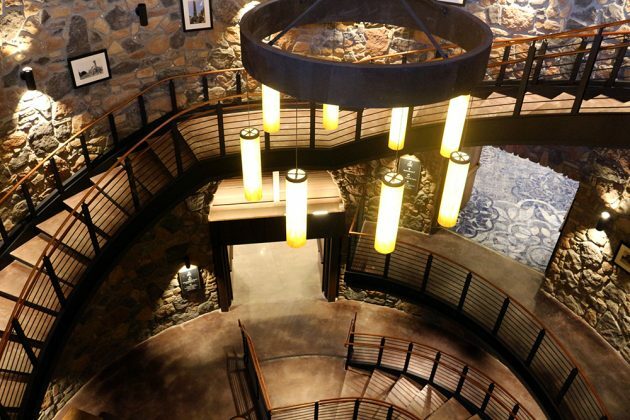 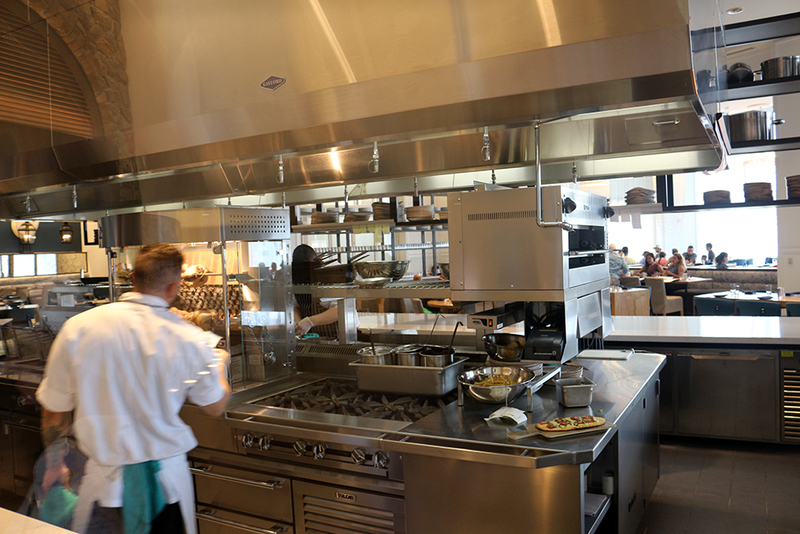 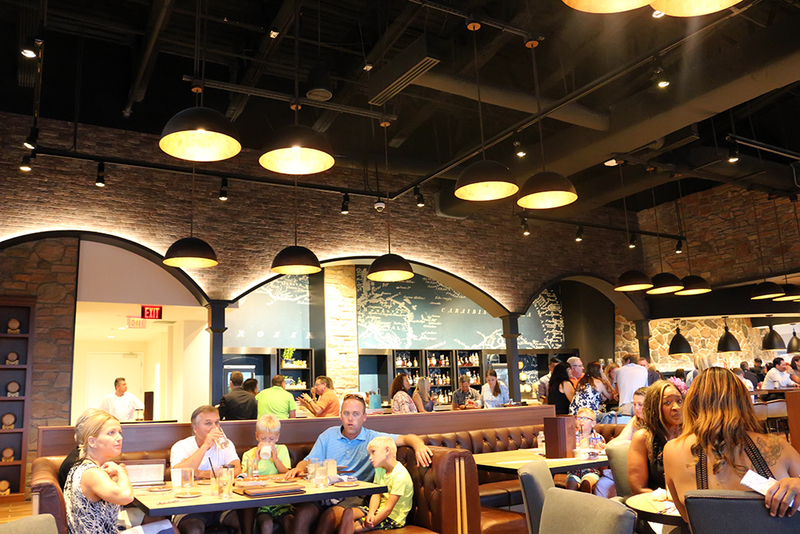 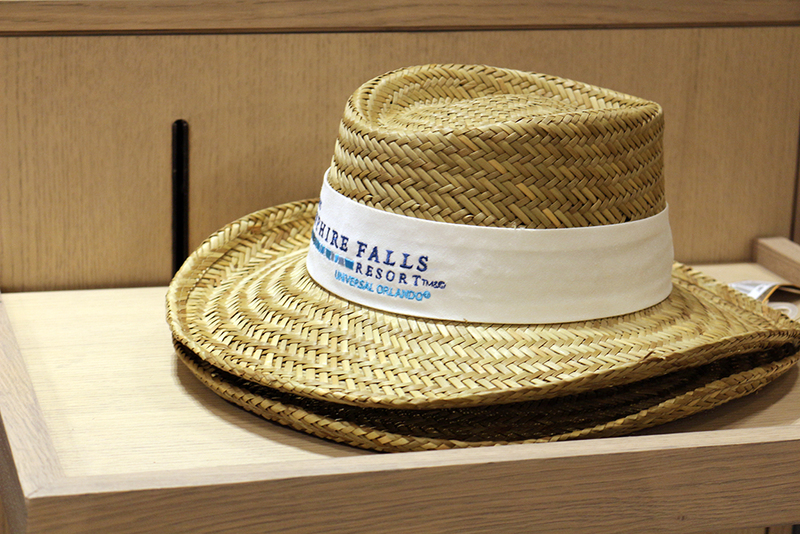 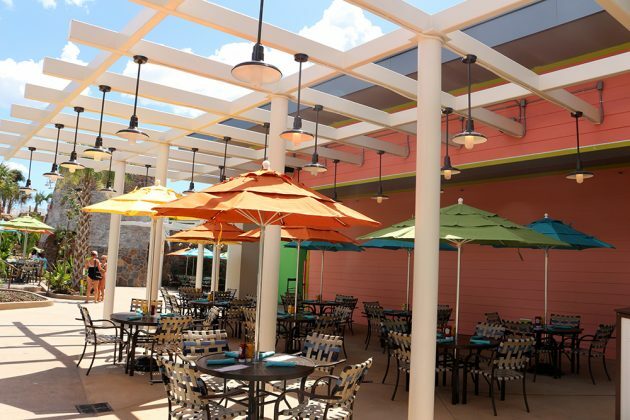 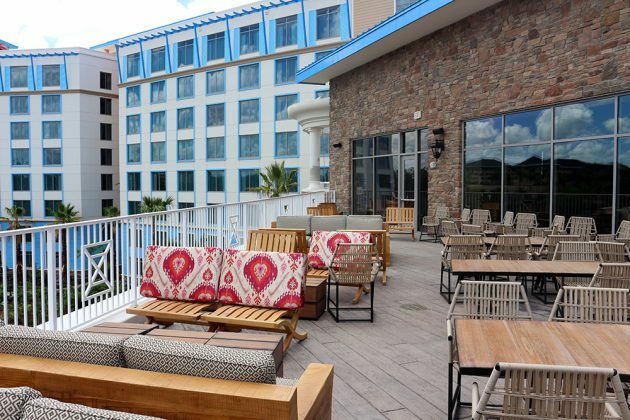 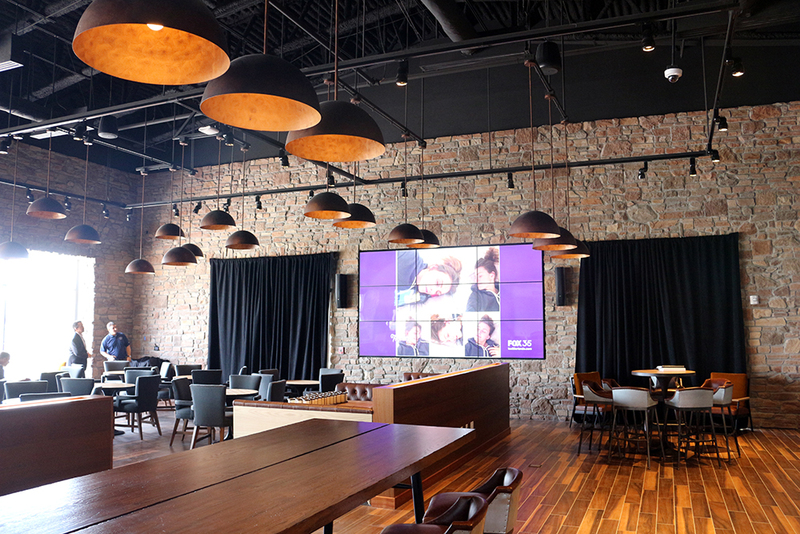 Sapphire Falls is another great addition to Universal’s hotel line-up, that offers great dining options and some of the best views of the entire Resort.